This entry was posted in Posts in Thai / โพสต์ภาษาไทย on August 30, 2013 by admin. We got lost when we left Korla and didn’t find the way back to the motorway. Instead of riding on the smooth tarmac we ended up leaving the town on a small dirtroad that took us through the industrial areas at the outskirts of town. There was an intense traffic of trucks and we felt much more unsafe on this little side road than on the big motorway and our intention was to get back to it as quickly as possible. Although Korla is a oasis city with lots of greenery, parks and tree lined avenues, the desert is not far away. 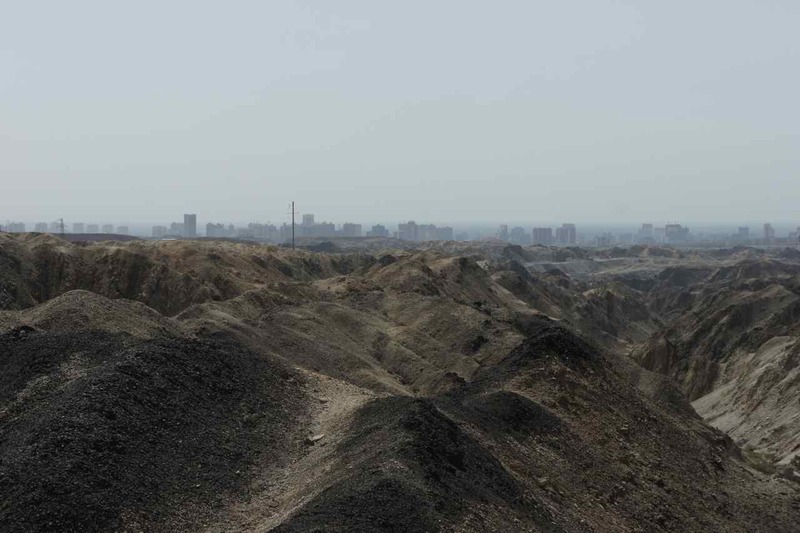 Right after having left the industrial areas of the town we got this view which clearly shows how close the desert and the city are to each other. Leaving town on a backroad took us through some very beuatiful mountain areas. The road was steep and the surface was just gravel but there was very little traffic and we could enjoy the scenery undisturbed by cars and trucks. We followed this little backroad as it twisted itself through a valley, but all of a sudden it was going to pass under the motorway. There was a staircase down from the motorway and we wouldn’t allow ourselves to miss an opportunity like this and quickly carried our bikes and luggage up to the big and nice road where we could continue at a much higher speed. 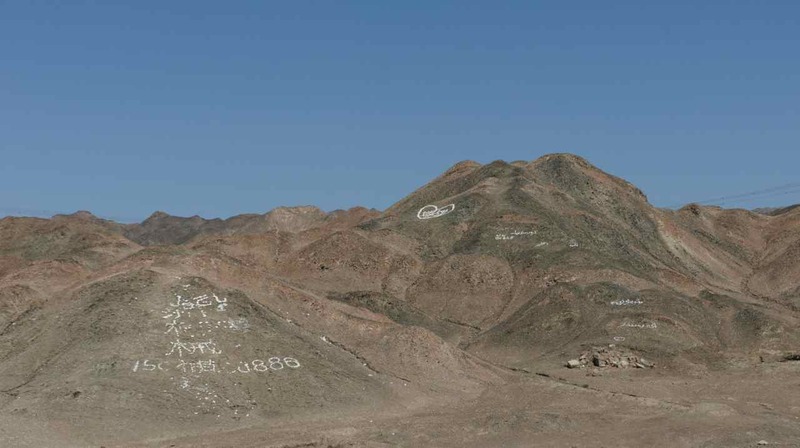 The desert is dry – that is actually the definition of a desert – but there are exceptions. 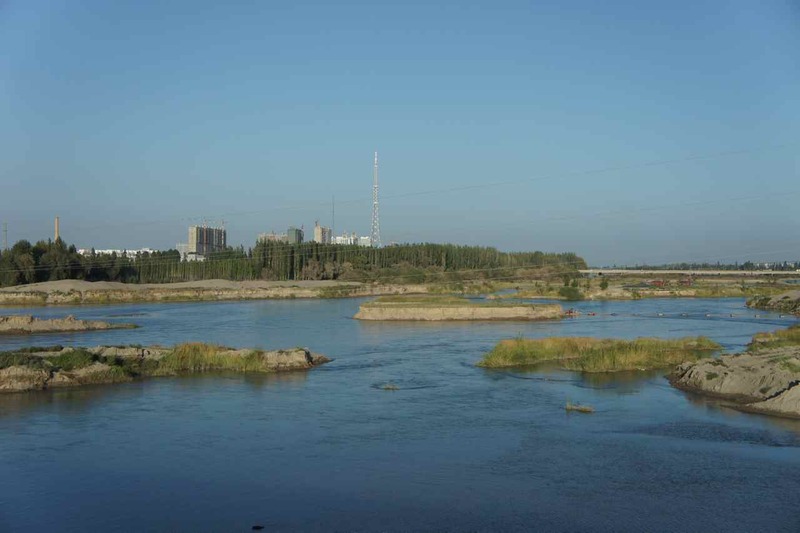 When we approached the city of Yanqi we went across a bridge over a river leading from the Tian Shan mountains to Lake Bosten. This lake is half the size of lake Vättern in Sweden and we saw a number of signs for seaside (lakeside?) resorts with pictures of kids playing on banana boats….. When we passed this stream we could see herons and other seabirds in or around the water. Seeing a heron in a desert is something I never would have expected. The heron has just left…. 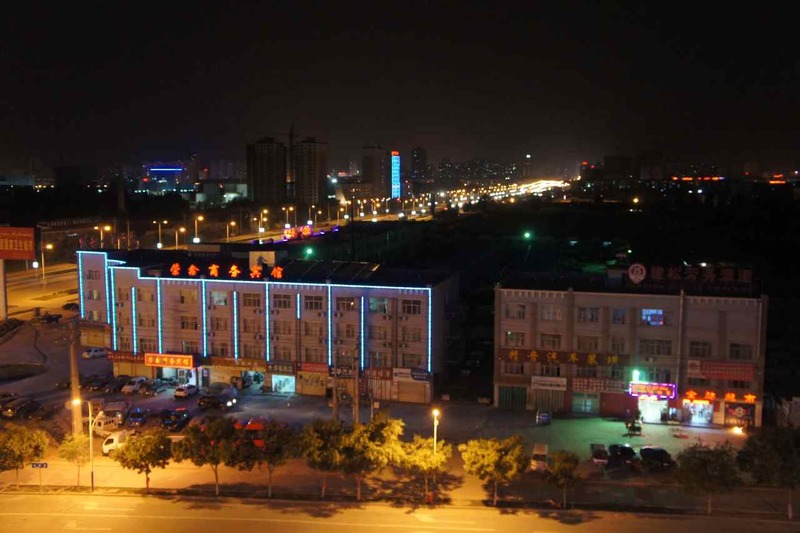 When we got closer to the city of Yanqi it turned out that even this city would have been a big city by Swedish standards. 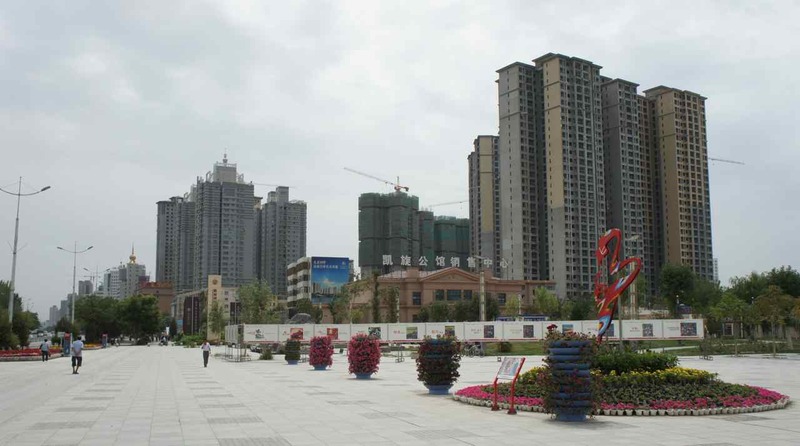 It has a lot of high rise buildings in the centre and in the surrounding areas we could see numerous construction sites where large apartment blocks were being built. 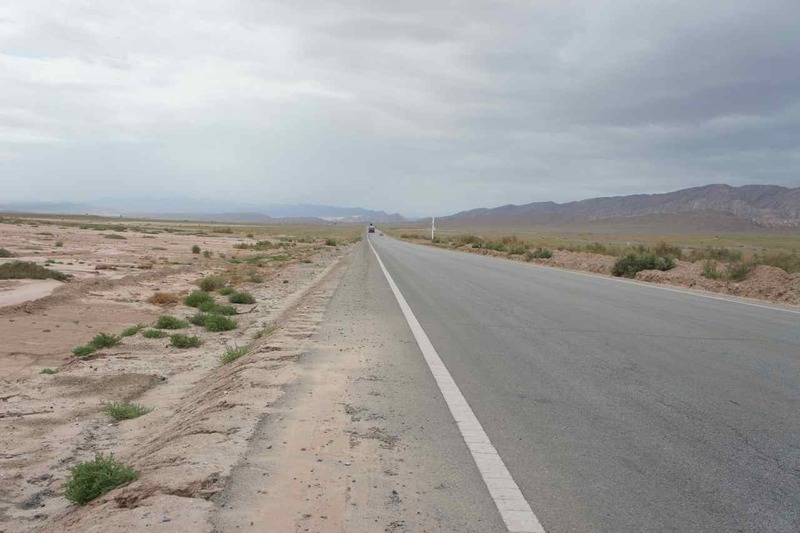 Korla and Yanqi are not far apart, only some 60 km. 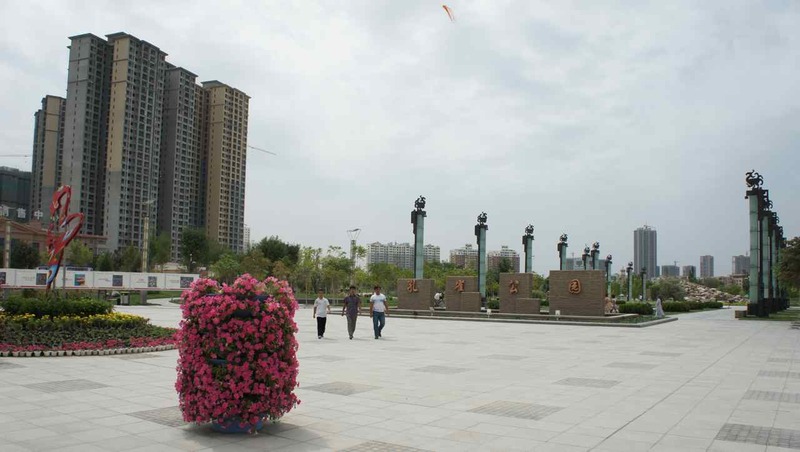 Our intention was to have a half day of rest and start late which meant we couldn’t expect to get any further than Yanqi. We didn’t want to camp and went into the city to find a hotel to stay at. 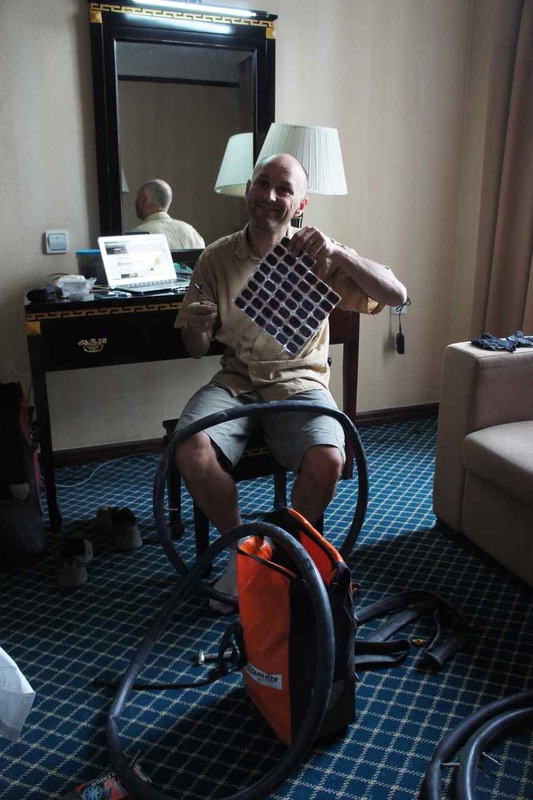 For the first time we ran into the trouble all foreigners traveling to cities off the beaten track in China sooner or later have to face – finding a hotel. 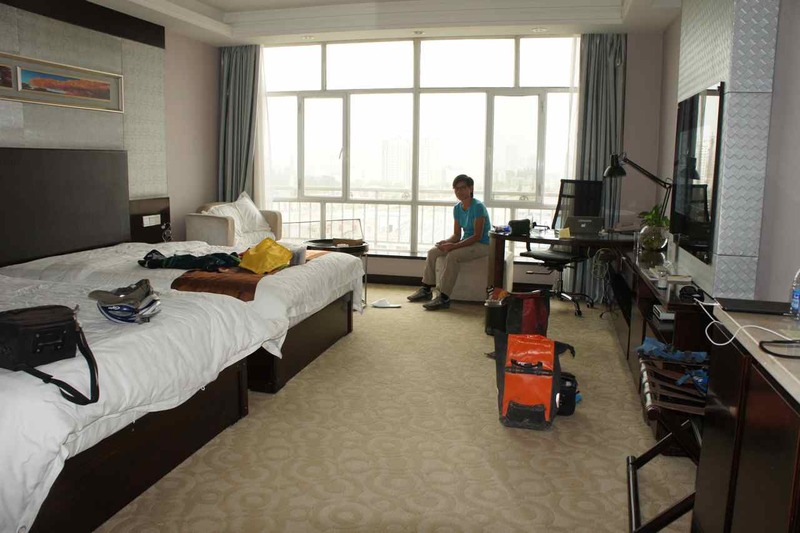 Hotels in China needs a special license to be able to host foreigners. The first hotel we asked wouldn’t host us but told us try at another further down the street. On the way there we found another one that labelled itself as a business hotel. Wej went in to ask but was denied and told to go to another hotel. The front desk staff helped her by drawing a map how to get there. 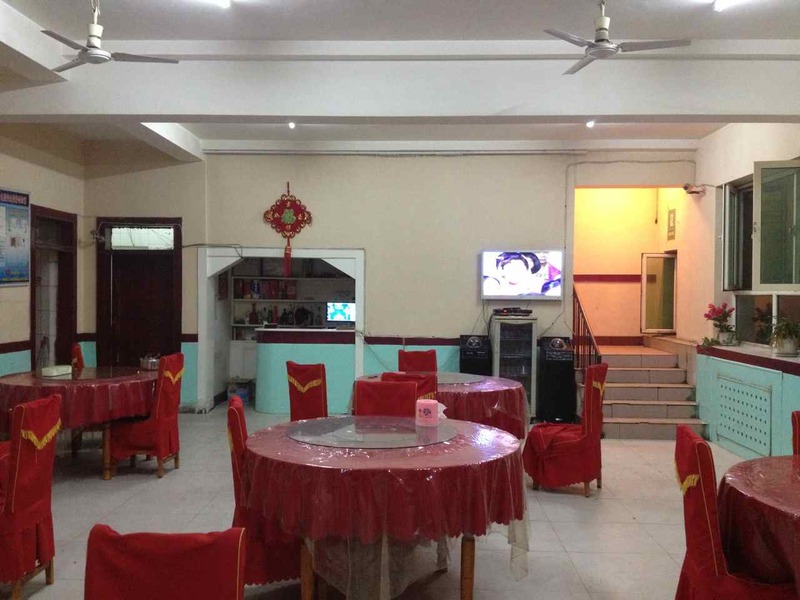 We find it very interesting how a hotel in an country so reliant on export as China is, can call itself ”business hotel” while not being able to host a foreigner. When we later arrived at the only hotel being able to host us Wej went inside to check in while I waited outside. A young boy at the age of around 5 walked past me holding his parents hands. He was so surprised to see me and stared so intensly that his eyes almost popped out. When he had passed he almost walked backwards staring at me while his poor parents seemed to be embarrased for his behaviour. All the way we have got used to be the odd ones, but here in China it is only me. Wej blends in and everyone seems to think that she is chinese, which is not completely wrong. Nobody expects me to be able to speak chinese so every time Wej is approached by curious people I can take a step back and pretend to be a kid eating monster. The ride from Yanqi towards the town of Hoxhud was not very interesting. It was the same old motorway and the same old mountains. After a stop at a gas station just after a tollstation we continued towards the next service area some 110 km away where we intended to camp. Before reaching that service area the road crosses the mountain ridge that we having been cycling along for almost two weeks and that we have got bored starting at. When going across those mountains we got some very nice views. 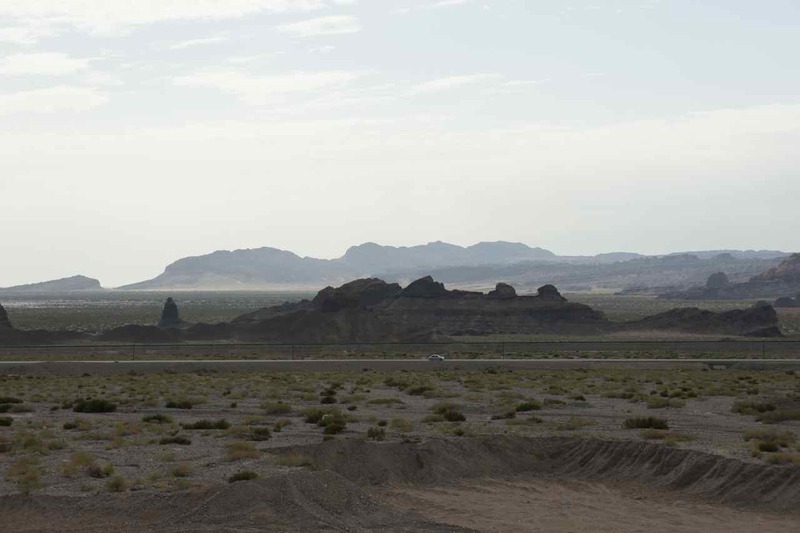 The landscape changed from rather boring to very fascinating within only a few kilometers. On the way down we got some very nice downhill sections where we overtook many trucks that descended from the mountains at very low speed using their lowest gears. At one of the turns we saw something we didn’t know what it was. It looked like a ramp beside one of the sharp bends of the road. 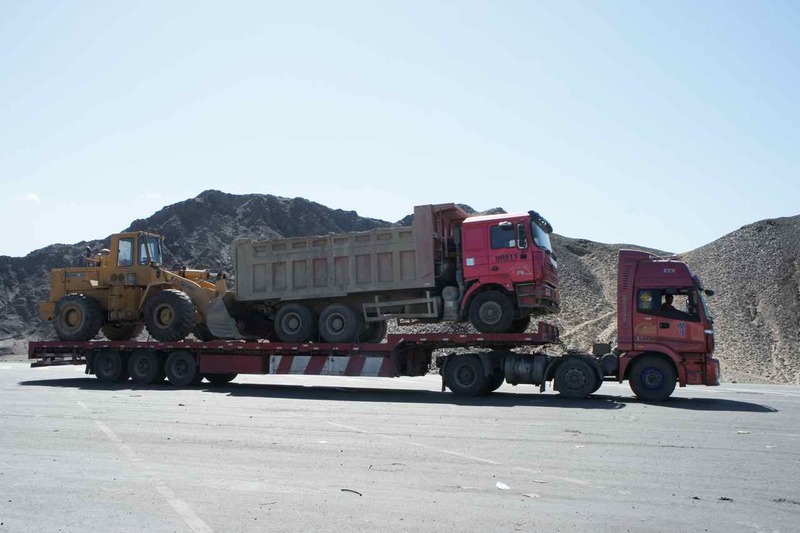 When we got closer we saw that the ramp was signposted many times and covered by a thick layer of gravel which made us believe that this was a ramp where runaway trucks that have lost their capactiy to brake can get their vehicles to a stop. I have never seen such ramps before but I have now learnt that they are common in mountainous regions throughout the world. On the day we cycled to Toksun we started at around 1000 meters altitude and climbed up to 1750 meters. It was a smooth climb on the shoulder of the motorway. We stopped many times to take photos of the very beautiful landscape. When it then was time to descend we would loose very much altitude. 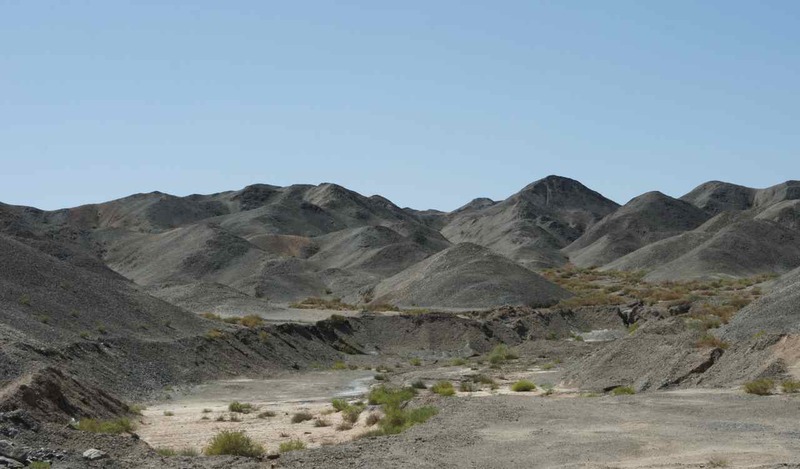 Toksun is located in the Turpan depression which is the lowest lying area in China. The deepest part of the depression is around 150 meters below the sea level. We stayed quite a long time at the restaurant to both eat and wait for the cooler evening hours. We planned to cycled through the city and camp outside, but in an intersection I got today’s second flat tyre. Since the sun was just about to set we changed to a new innertube in less than 10 minutes – we are improving our team work when it comes to fixing flat tyres…. After some 5-6 km I felt that the wheel we jsut repaired got softer and softer and I suspected we had been too quick when repairing it. Too tired to fix it we turned into the first camp spot we could find which turned out to be next to an onion field. 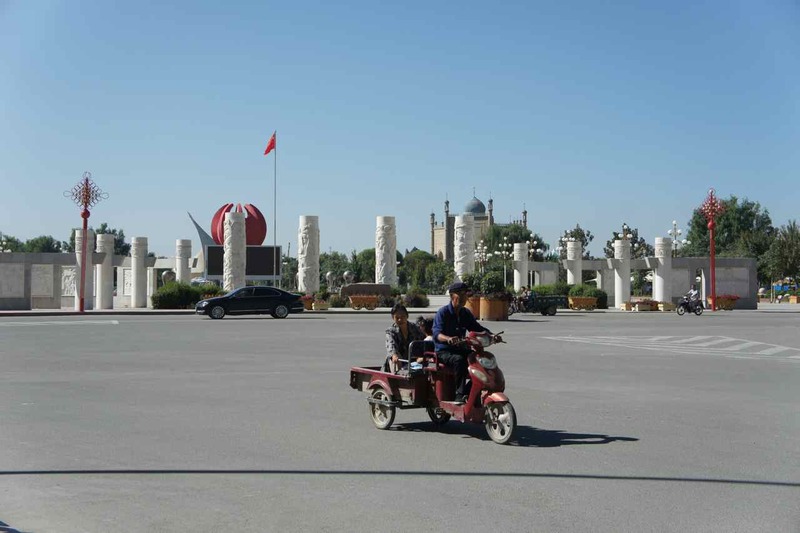 We arrived to Turpan early in the afternoon. Our plan was to take a rest in the afternoon and start early tomorrow. This entry was posted in Posts in English on August 29, 2013 by admin. This entry was posted in Posts in Thai / โพสต์ภาษาไทย on August 26, 2013 by admin. It seems that it is impossible for us to make an early start every time we stay at a nice hotel. 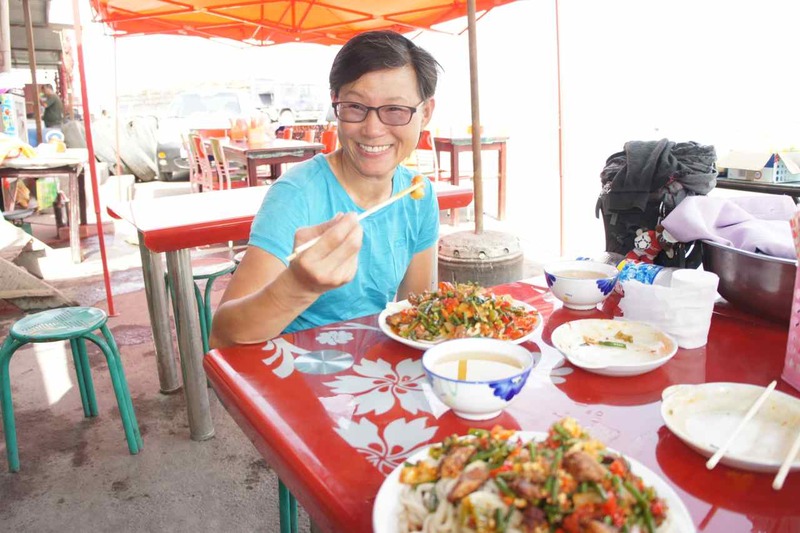 The breakfast buffet is something we don’t want to miss and then it takes time to pack and carry down our luggage, get our bikes and then find our way out of the city. The last part takes more time than one would imagine. 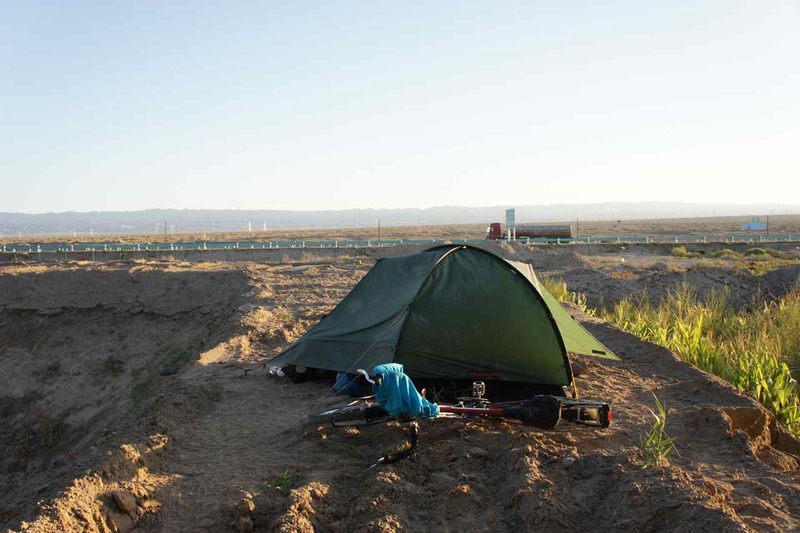 When we camp, we can just load our bikes and continue in the same direction without having to navigate out of a large city with many roads leading in different directions. 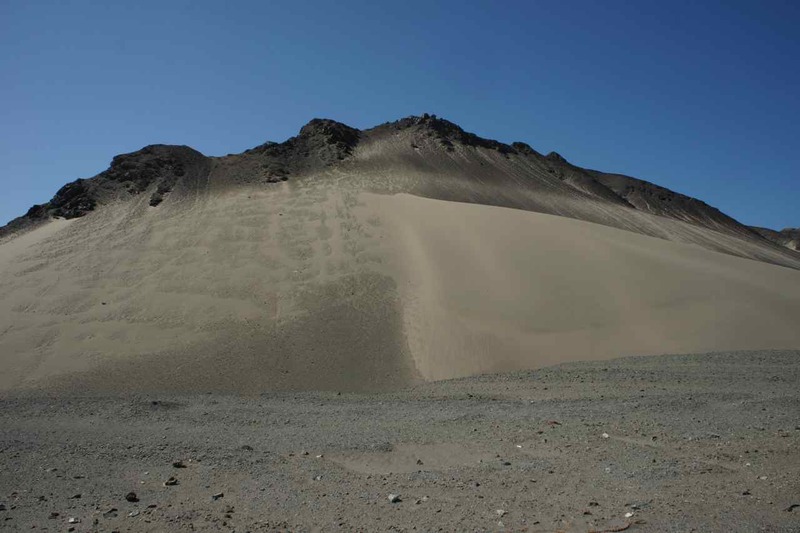 There are two main roads that go in an east-west direction along the northern end of the Taklamakan desert. 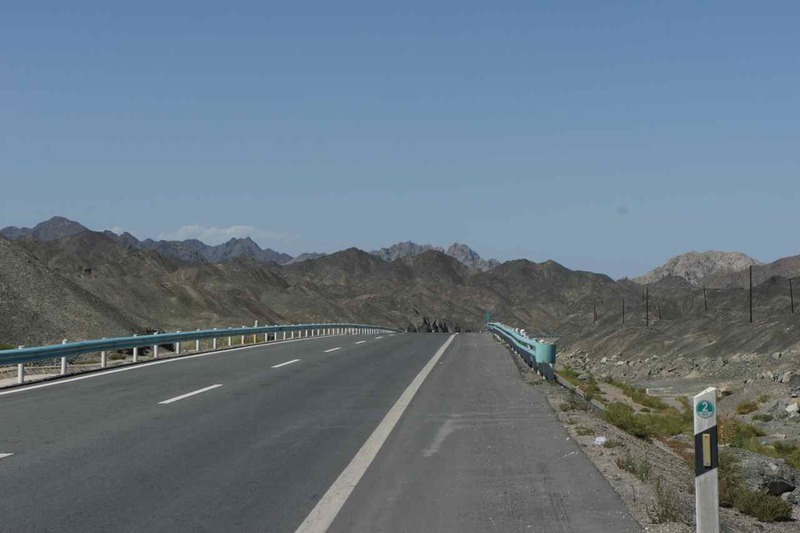 One of them is the old road and the other is a big and very nice motorway (we cycled on un-finished parts of it from Kashgar). 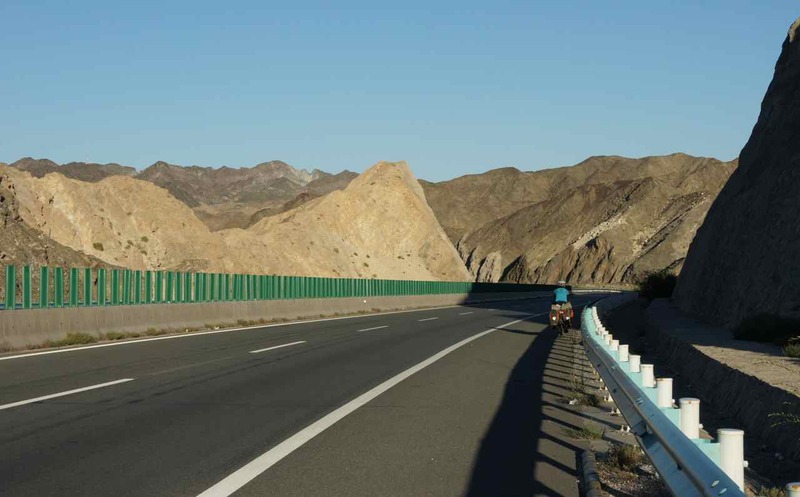 We have heard stories from other cyclists that it is OK to cycle on Chinese motorways, at least in the western part of the country where there are not any really good alternatives. 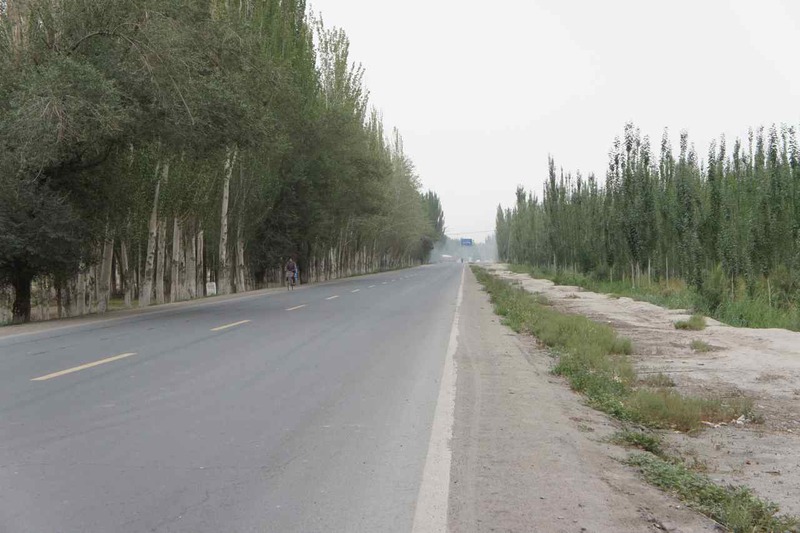 Outside Aksu there is a large intersection where the old road and the motorway cross each other. Clear signs showed that pedestrians, motorcycles, horse carriages and bicycles are not allowed on the motorway. What to do, follow the law and go on the smaller and longer old road or break the law and go on the smooth, shorter and bigger motorway? China is a big country and it accounts for about 1/3 of our entire trip. Our visa is valid for 60 days and can only be extended once with 30 more days so we will need to move on quickly. 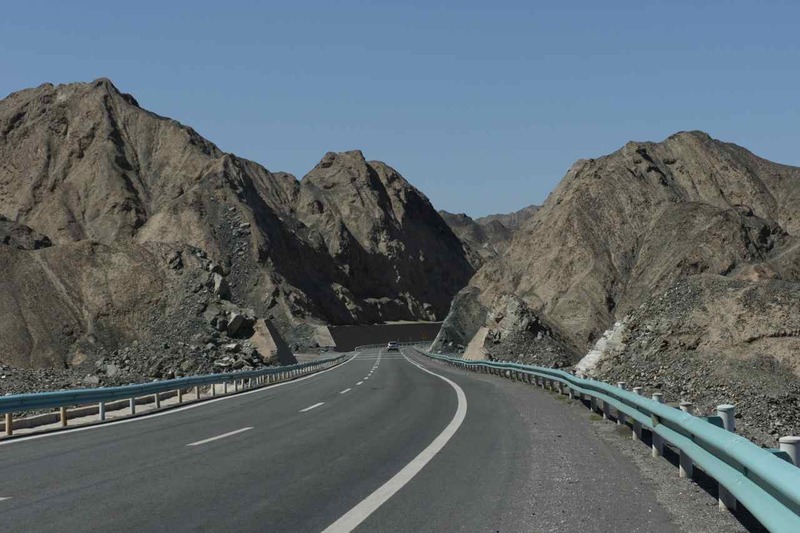 The landscape in this part of China is not very exiting so we have decided to try to put in as many kilometers as possible in this region so we chose going on the motorway. This motorway is a tollway and after 3 kilometers we came to a toll station. We were afraid that they might tell us to turn back and go on the old road but instead the lady in the ticket booth waved us through and indicated by pointing that we should ride on the shoulder. The motorway is very modern. 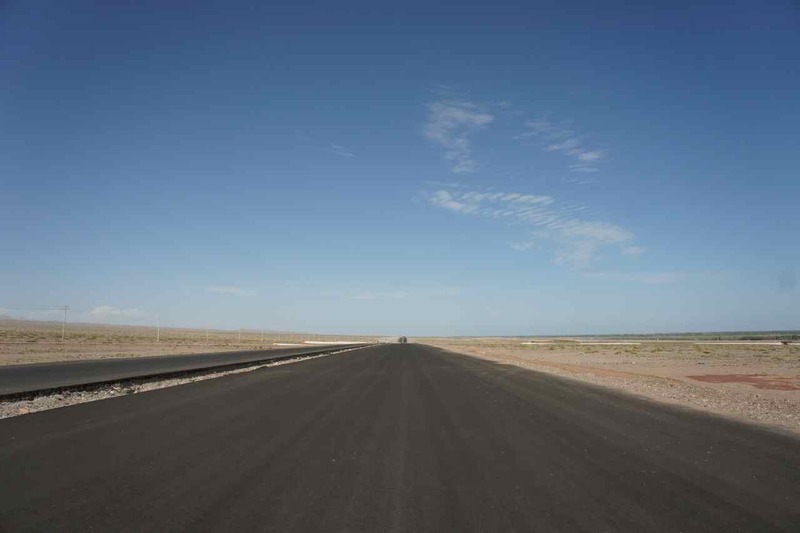 It has two lanes and a very wide shoulder – actually that shoulder is just as wide as each lane, and nobody travels on that shoulder. Nobody but two cyclists on their way from Göteborg to Bangkok. There are advantages and disadvantages by cycling on a motorway. 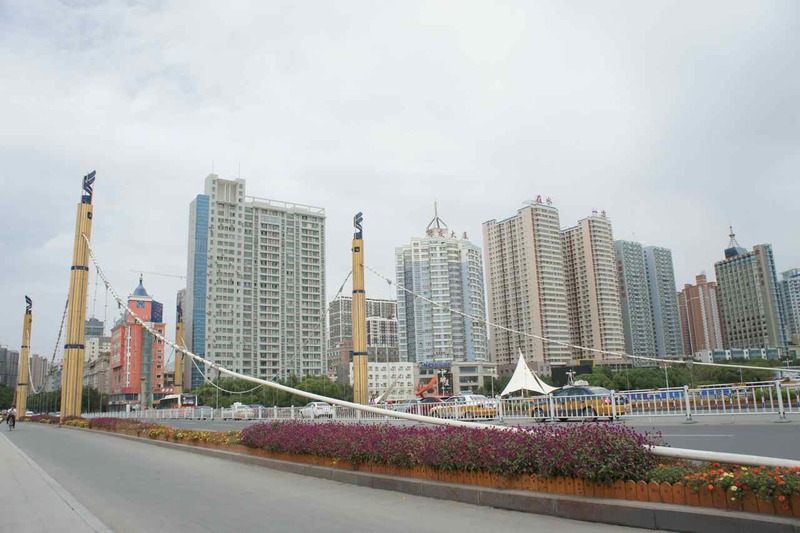 The main advantage is that we can travel at high speed and do many kilometers per day. 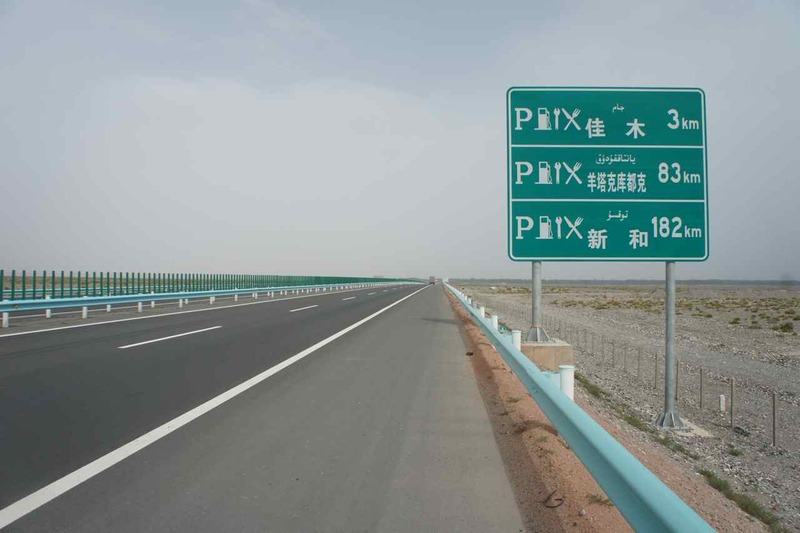 The disadvantages is that it is far between gas stations or shops (up to 100 km) and that the motorway is fenced off by a barbed wire fence along its route. Although the road was very good to ride on our late start meant that we didn’t get very far and since we hadn’t learnt how to deal with the motorway yet, we decided to leave it and ride to a small town on the old road. In the middle of that town Wej spotted something she thought was a hotel. 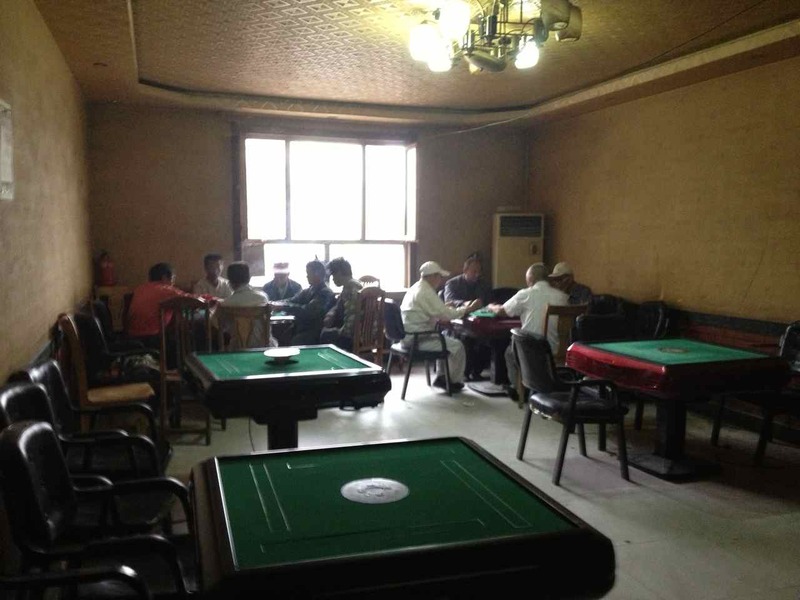 She stopped, went in and came out and told me that there was a room for 80 Yuan (10 €). The room had definately seen better days but we didn’t mind. 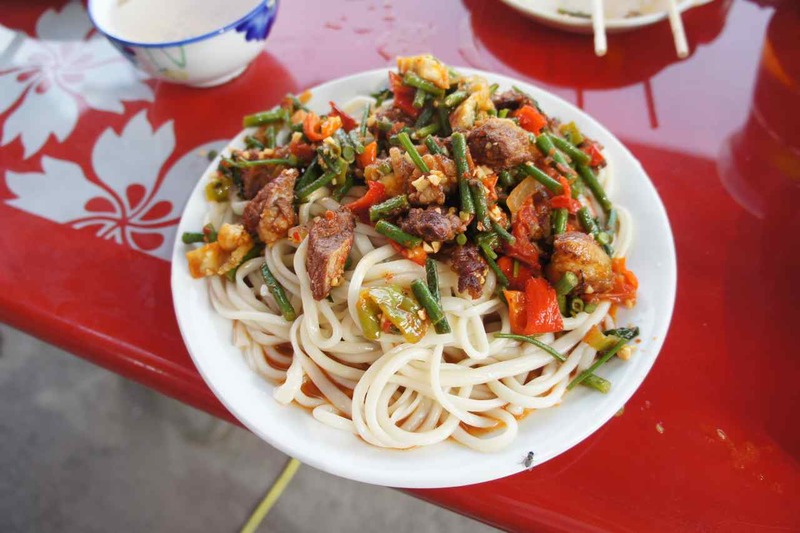 Having eaten mainly central asian food even since we entered China we were happy to find a chinese restaurant in front of our ”hotel”. The following morning was cool and I decided to wear my long pants and jacket. 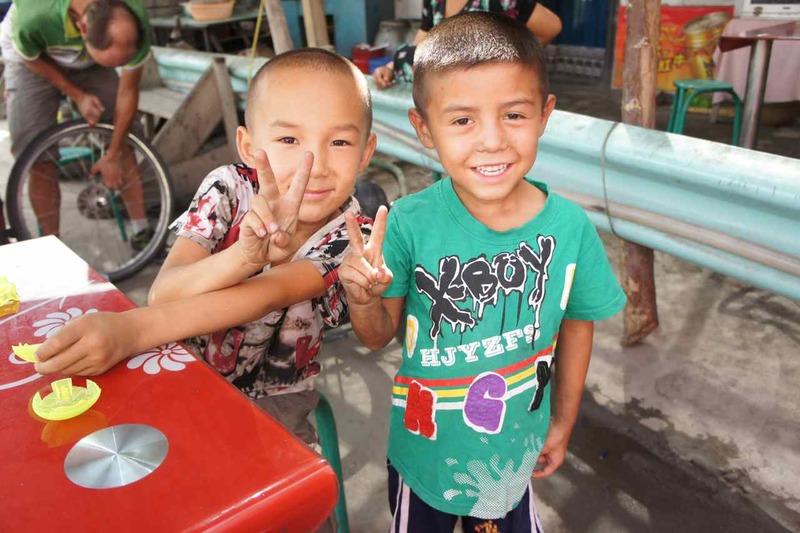 I have sometimes considered to send them home, but I needed them in Kyrgyzstan and now I needed them in the chinese desert too. After 30 km on the old road we once again entered the new motorway that goes along the mountain ridge. The landscape is rather boring and it wouldn’t have been better if we had cycled on the old road which sometimes is next to where we cycle or sometimes very far away. The traffic on the motorway was not intense at all and we could do many kilometers without putting in too much effort. So why do we cycle along a road that isn’t very beautiful, has few cities and tourist attractions? Why simply not take the train? The answer to this takes us back to the topic about bikers vs. travelers that is often dicussed among cycling enthusiasts. A biker is someone who wants to cycle from A to B just to have done it and who is mainly not interested in exploring what is in between A and B. The biker may want to prove that it is possible or want to do it under a certain time etc. A traveler is the opposite. For the traveler it is not the cycling that is important. The traveler have for one reason or another found out that a bicycle is a very suitable means of transportation when exploring the world. A traveler wouldn’t mind taking a train to skip some uninteresting parts. 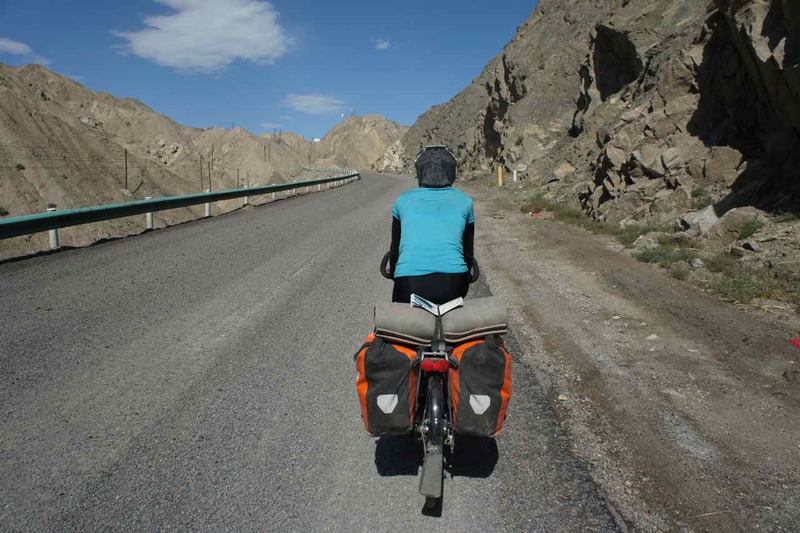 During our journey we have met many cycling tourists, some can easily be labeled as bikers, some as pure cycle travelers and some have been something in between. I have written about this before but I think it is now time to come back to the question of what we are, bikers or travelers? We think that we are a bit of both. 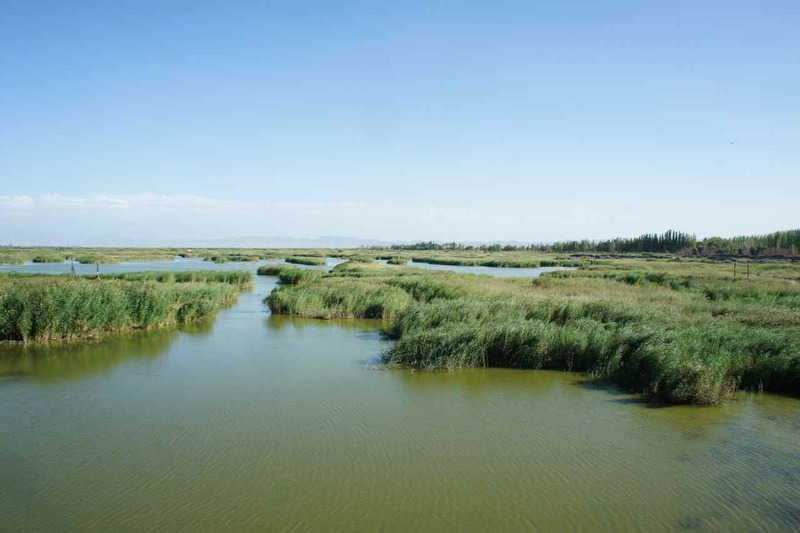 While we hadn’t yet crossed the Caspian Sean we saw ourselves as mainly travelers. We enjoyed meeting people, doing sidetrips, having nice food in restaurants and going to museums and so on. 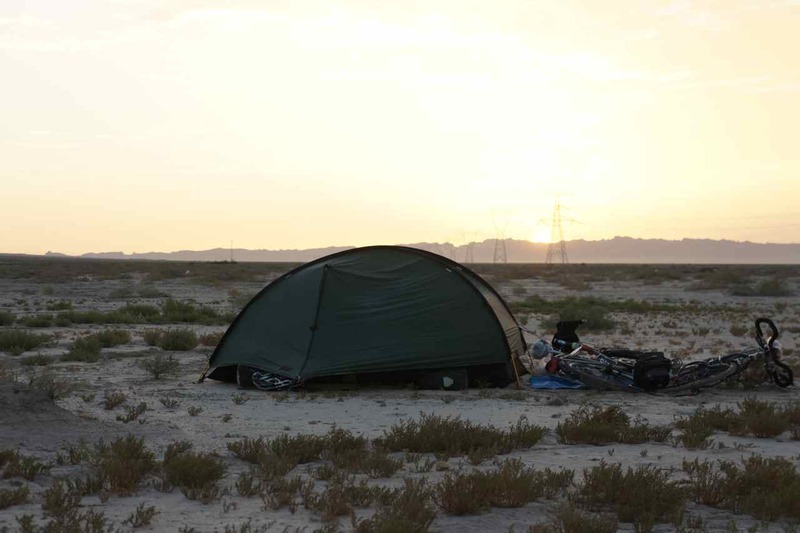 The endeavors in the Kazak and Uzbek deserts put us more into the biker category. 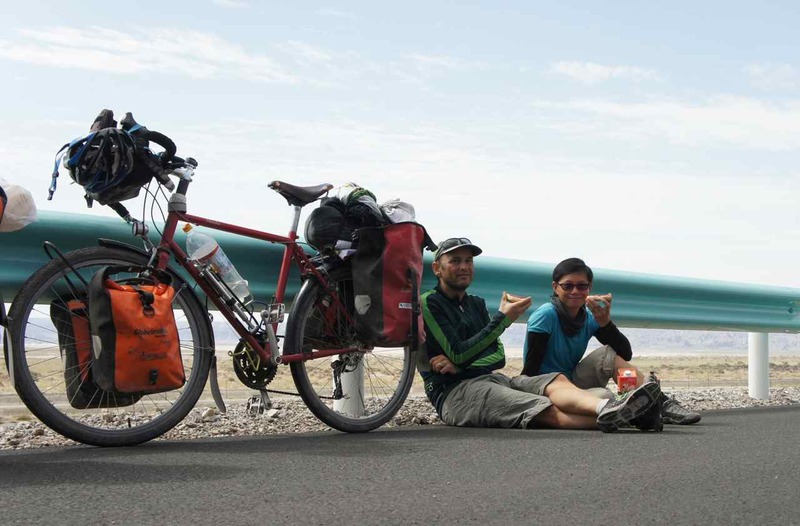 We could have gone by train this part, but we wanted to try to cycle in a dessert and having come all the way here on our own wheels we wanted to continue to go by our own muscle power. 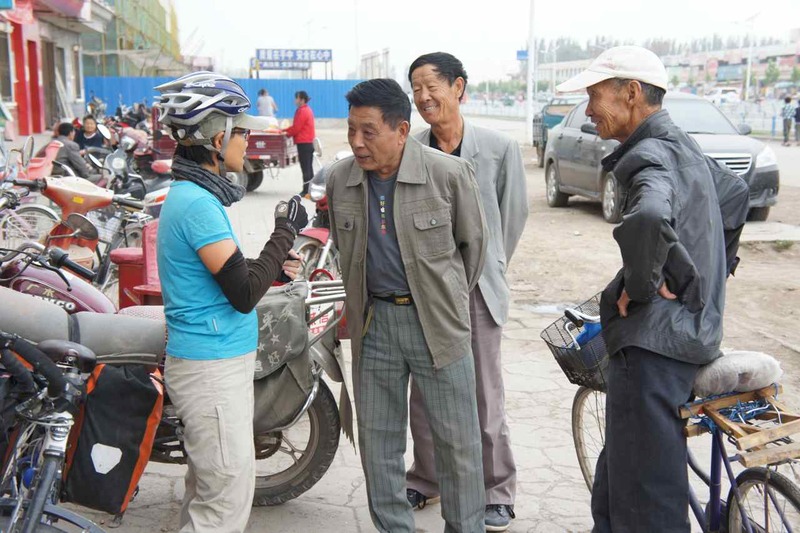 I think it is fair to say that we have now moved into the biker category – if we move back to the traveler category, we will soon be on a train through this region…. 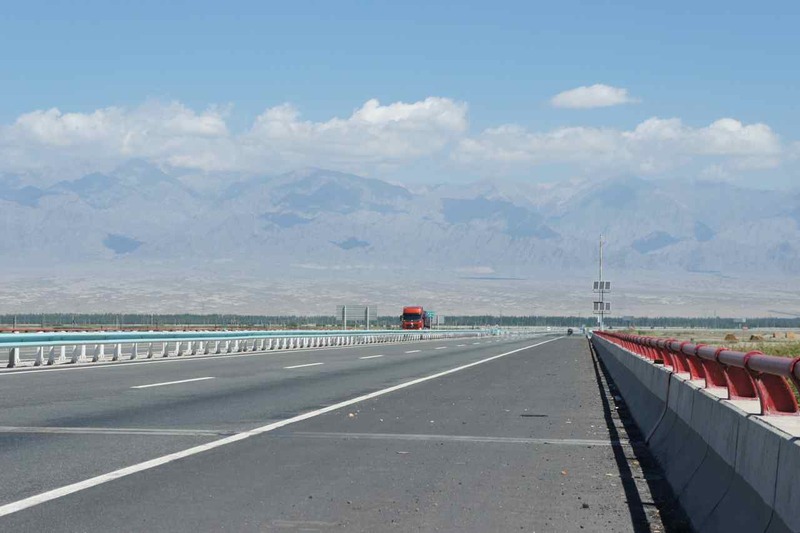 Riding on the motorway along the Taklamakan desert is nothing exiting at all. When it can’t be an exiting journey through a interesting landscape it may still be a journey into the landscapes of one’s own mind. Cycling kilometer after kilometer and the views stay the same, the same kind of trucks pass every few minutes and sometimes the road does a little bend – that’s what happens during our days now. Sometimes we play games such as guessing who can make the best guess of the distance to a bridge that we can see far ahead of us. It would be great to listen to music or audio books but we don’t dare to not be able to hear the oncoming traffic. If there is no traffic we ride beside each other and talk. So what else to do to kill the time? I personally have allowed myself to start thinking of the end of this journey. Before, when we were still in Turkey or Caucasus, I would immediately force myself to think about something else everytime my brain painted the picture of me arriving to Banglen or riding across the Chao Phraya river in Bangkok. Now I have started to allow myself to think about how it will be to get there, what kind of reactions I think I will have, what I would like to do when I arrive and so on. We arrived China on August 12 so we have to leave the country no later than November 10 and then to Laos which is a neighbour to Thailand, so it is as fair to start thinking about getting there as it was to think about riding into Istanbul when we boarded the ferry that took us to Poland. If entertaining oneself by fantasies about the end of the trip isn’t enough, one could always resort to some practical jobs such as fixing flat tyres….. The service areas with gas stations and shops are far apart but there are a few signs indicating the distance to the next one. Towards the end of the second day after leaving Aksu we spotted the service area from far away. 500 meter before arriving there I got a flat tyre on my rear wheel. First I thought about walking the bike to the service area, but then I re-considered and decided to change the innertube beside the road. 20 minutes later we rolled into the service area. It was late in the afternoon and time to find a place to camp. 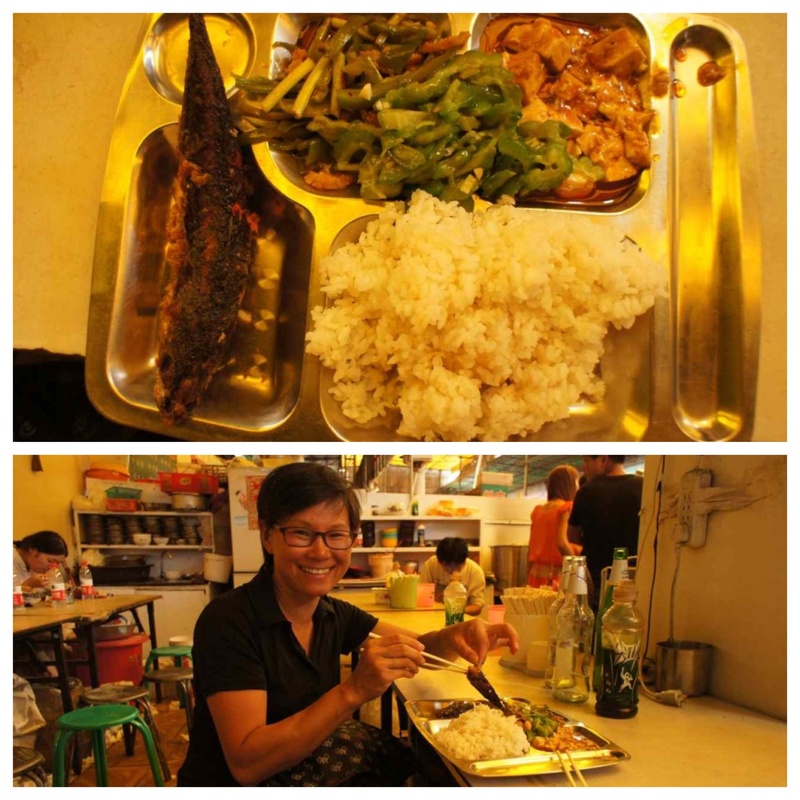 Our intention was to cook our own food so we only needed to buy some water and wash ourselves at the restrooms. Unfortunately the water was turned off so we couldn’t wash away the dust on our faces. When we left the service area I got a second flat tyre when I was still on the entry ramp to the motorway. Two flat tyres within a kilometer is one too much. We walked back to the service station and I changed to yet another innertube and repaired the two ones that had got a puncture. Being delayed by the flat tyre we had to quickly find a camp site and only 2 km from the service station we found a hole in the barbed wire fence where we could get off the motorway. Wej urged me to throw away my old tyre and use the spare one we bought in Baku. I am not so convinced that it is as strong as the old one I have so I decided to only swap places. Front tyre was moved to the rear wheel and vice versa. 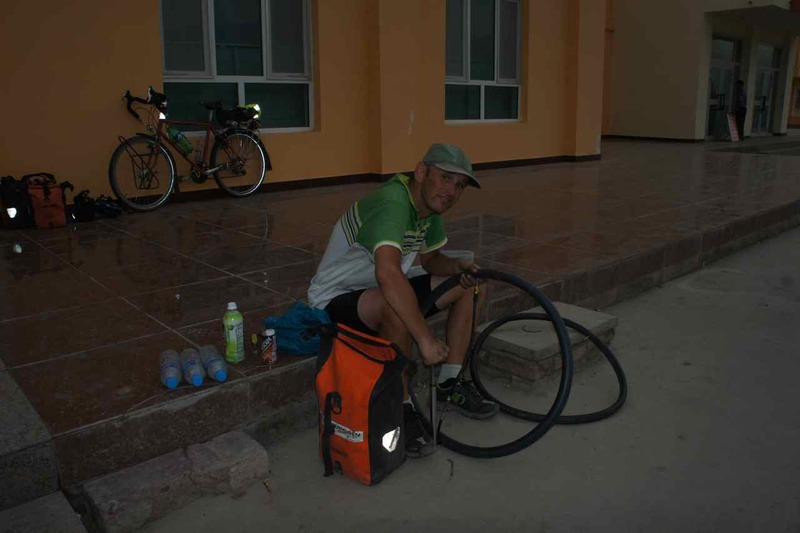 Although we started a bit late due to our work with changing tyres and patching holes in our innertubes we managed to make almost 180 km the third day after leaving Aksu. 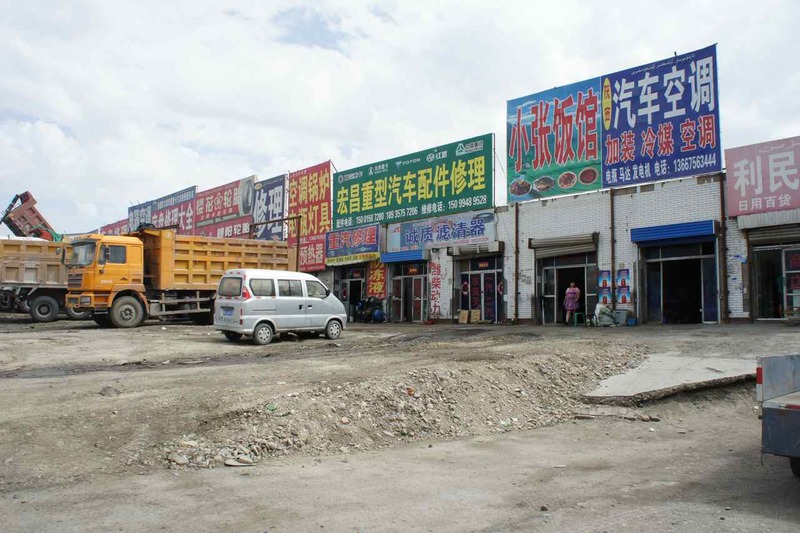 Google maps had indicated that there was a service station far away and these places usually has shops that sell food and water so we pressed hard to get there only to discover that this place was under construction. 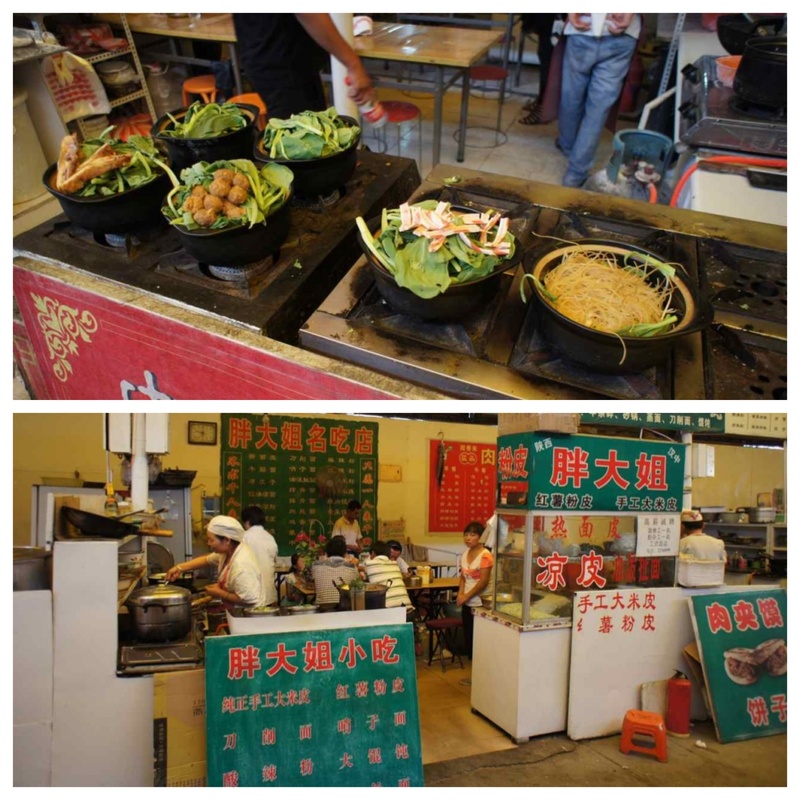 There was only a small food stall there and no restrooms. 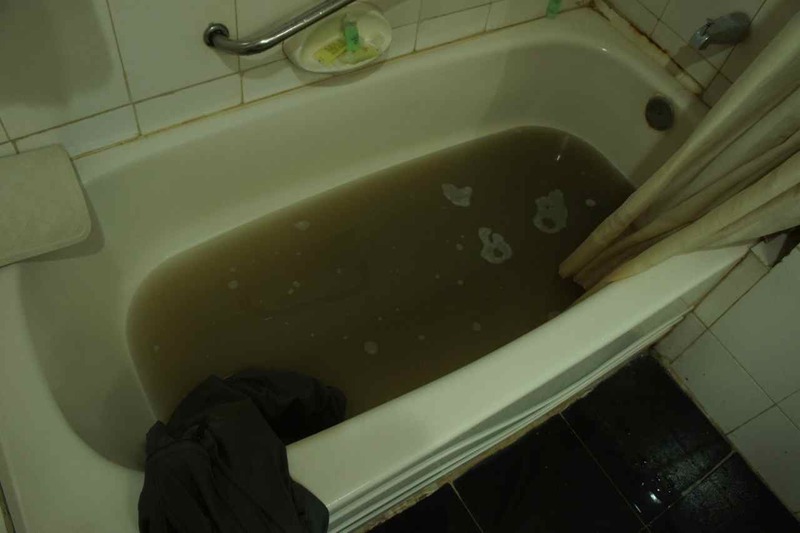 We bought two dozens of 0.5 liter water and used these to shower before going to bed in front of one of the buildings that were under construction. The next morning all hell broke loose…. After 471 meter I got my first flat tyre… Of course on the rear wheel (more difficult to change). I hadn’t even left the service area yet and I was disappointed to say the least. There was nothing to do but to change the innertube while all the kids around and the ladies working at the restaurant were watching. 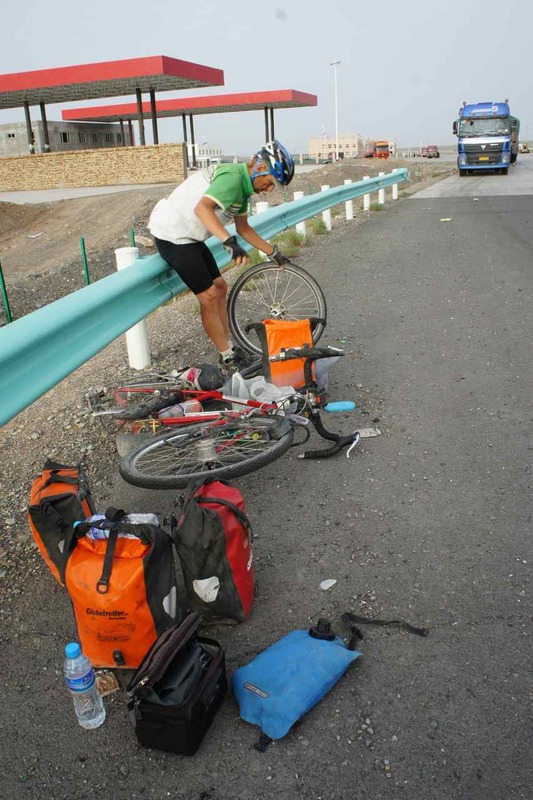 36 kilometers later (at 90 km that day) Wej shouts the all too familiar words ”My tyre is flat”. I got completely mad….. 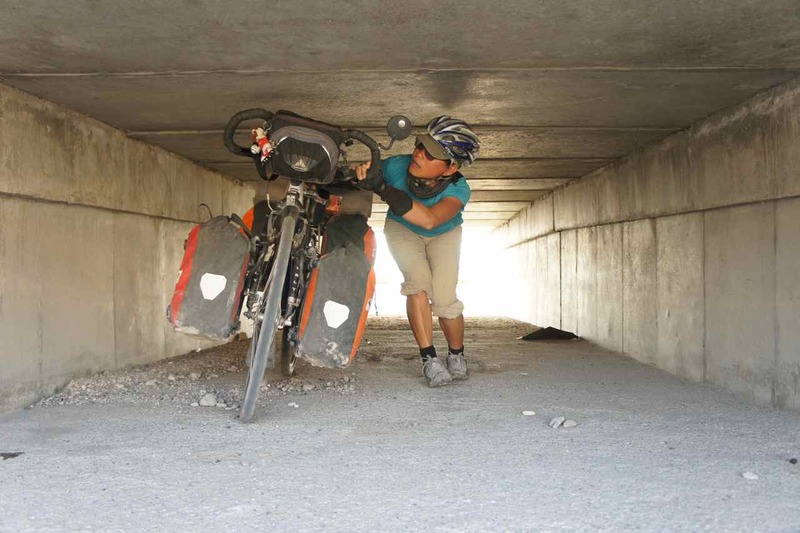 The sunshine was strong and we brought her bike and all tools to a culvert under the road and repaired it there. Once again it was a very thin and sharp little steel wire that had penetrated the wheel – this time at three different positions. We were now starting to run out of patches to repair the punctures and our pump show signs of wearing out so the situation was not good. Those steel wires were the culprits behind all our punctures the last few days but where do they come from? They are so small that is impossible to see them when cycling and we felt we didn’t have a fair chance to avoid them. Later when we were back on the road I stopped and took a look at a black string that lay on the roadside. It was a piece of a burst car or truck tyre that contained a metal cord. Now we knew where the little steel wires penetrating our tyres came from and we started to point at them to warn each other. 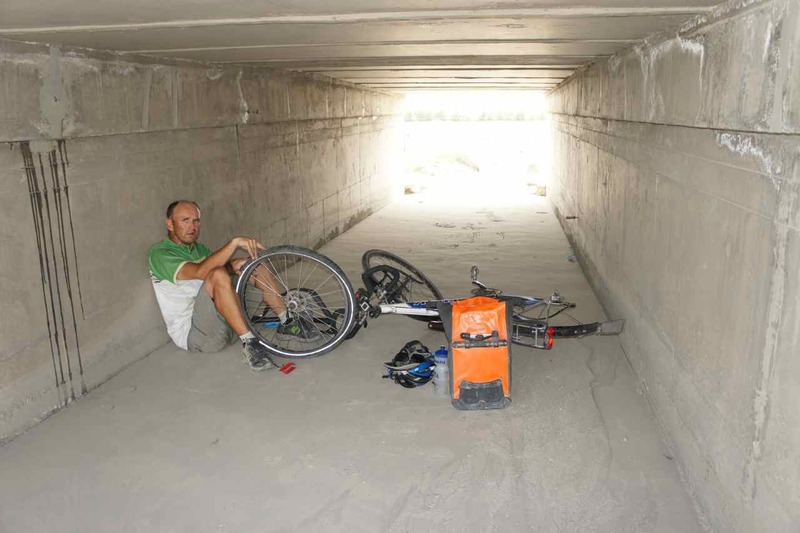 This is really disturbing and when we talked to our polish friend who rides 4 days ahead of us he confirmed that he had also got a couple of flat tyres when cycling on the highway. When we made it to the top of a little hill we suddenly saw the city of Korla. We thought it would be a small town, but instead we saw a city with a skyline. 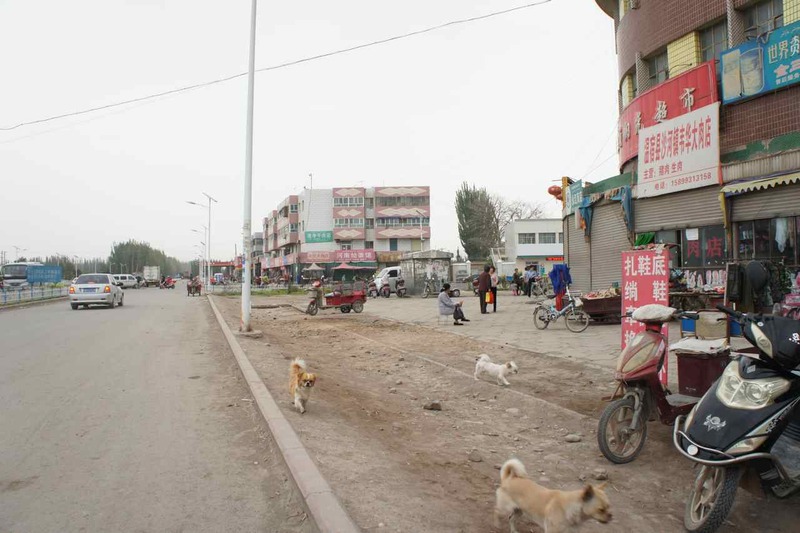 It has 700.000 inhabitants and is a small provincial town by chinese measures…. 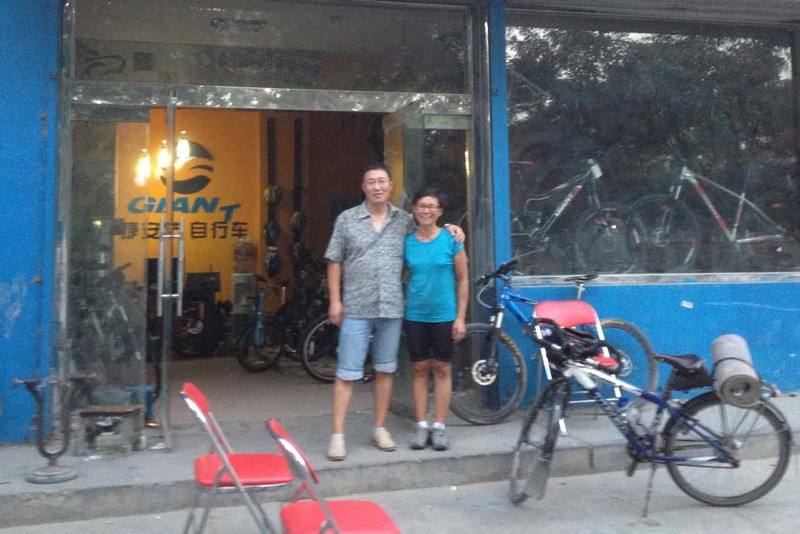 When we cycled into the city we spotted a proper bicycle shop. We stopped and wanted to patches and a new pump. I also needed to true my rear wheel and what happened was that we stopped for a day to settle all our bike matters. Both bikes now have new cassettes, chains and we have bought extra thick innertubes, 3 tubes of glue and 50 patches. 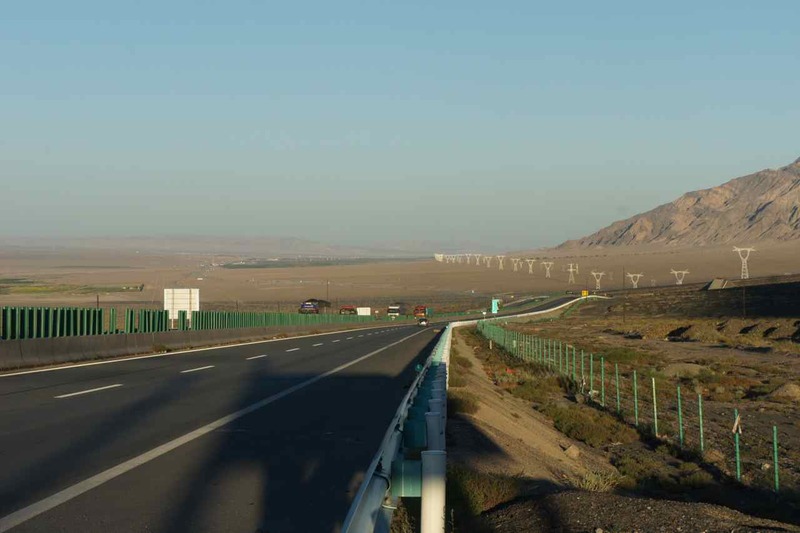 We hope that will be enough to take us to our next target – Turpan which is almost 400 km from here. This entry was posted in Posts in English on August 26, 2013 by admin. 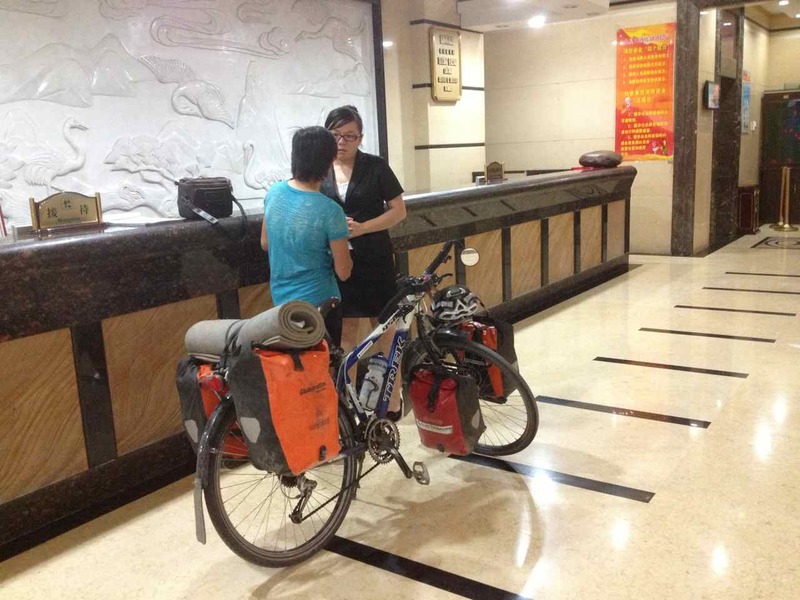 China is a big country and the distance to cycle in this country is around 5500 km. We only have a 60 day visa and we estimate it will take us around 80 days to get through so we will need to extend the validity of the visa somewhere. This puts some time pressure on us. Since the landscape in this area isn’t very exiting and that the towns and villages are far apart we feel we can as well press on and get some kilometers done. This and the coming weeks we will be chewing kilometers for breakfast, lunch and dinner and although we only cycle and do no sightseeing there are stories to be told but after having done almost 180 km today and 170 yesterday we both feel we should prioritize sleep instead of writing. 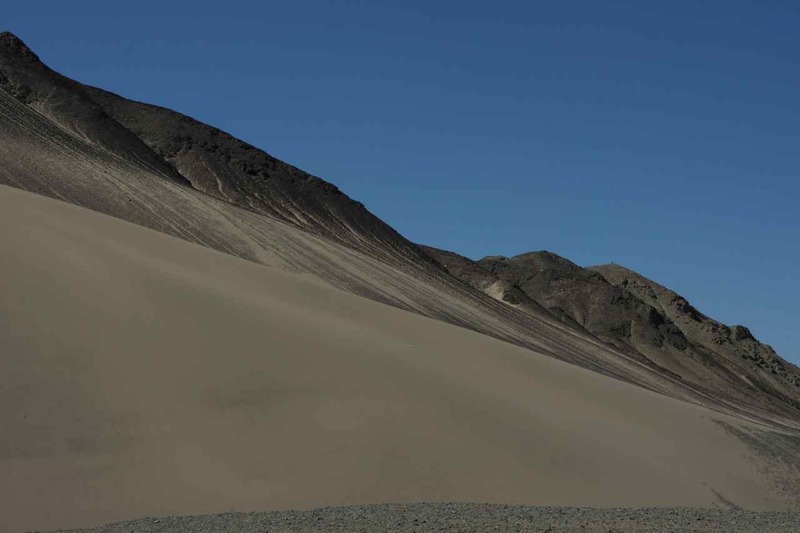 The forecast for tomorrow is headwind and we hope we will be able to make it to the city of Korla where we would like to stay at a hotel and update this blog with some stories from the road along the Taklamakan desert. This service area along the highway is unfinished so there are no restrooms and no running water. After 180 km in the sunshine we needed a shower and bought two dozens of 0,5 liter bottles of drinking water. We showered on the stairs next to were we sleep and this is the only photo of Wej showering that will ever be published on this blog. This entry was posted in Posts in English on August 23, 2013 by admin. This entry was posted in Posts in Thai / โพสต์ภาษาไทย on August 21, 2013 by admin. Wej woke up with a common cold and a sore throat yesterday morning. Instead of continuing cycling we decided to stay two days to let her get better. This means we are slightly behind the schedule which doesn’t really matter at all. The only thing we need to worry about timewise is the validity of our chinese visas and where and when to extend them. 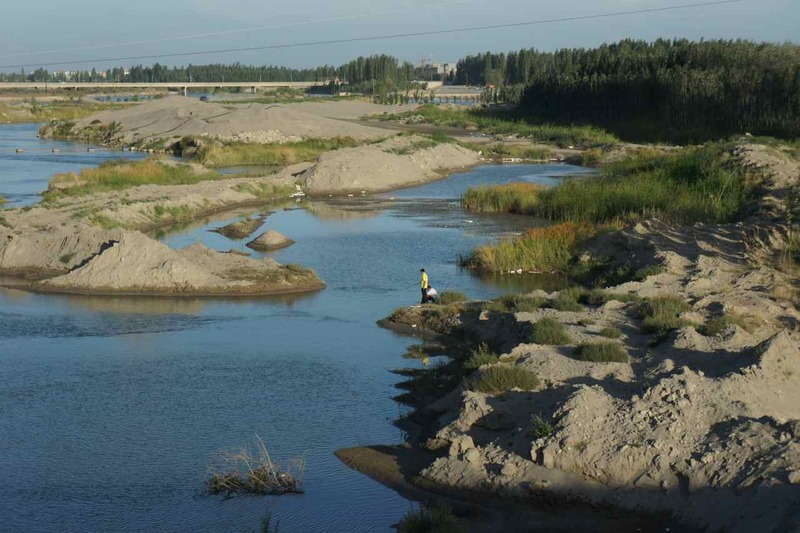 It feels very much like end of summer here in Aksu. The sky is grey, it is windy (tailwind…) and not more than maybe 20-22 degrees which feels rather cold in the strong wind. 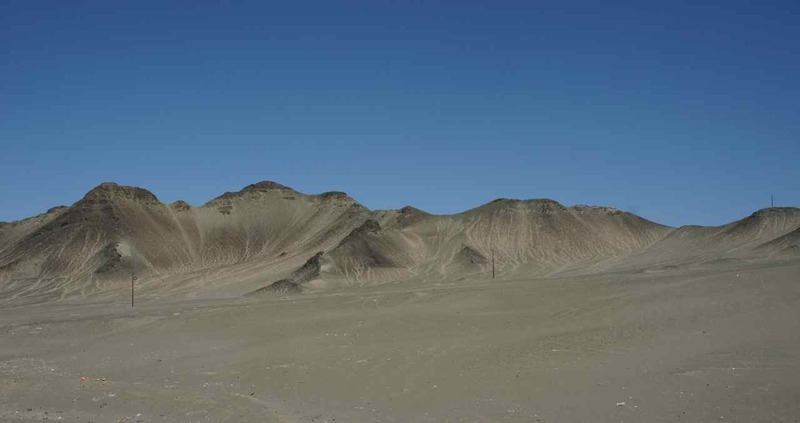 Our next stop will be in the city of Kuqa which is 250 km from here. We hope to be able to ride there in two days. 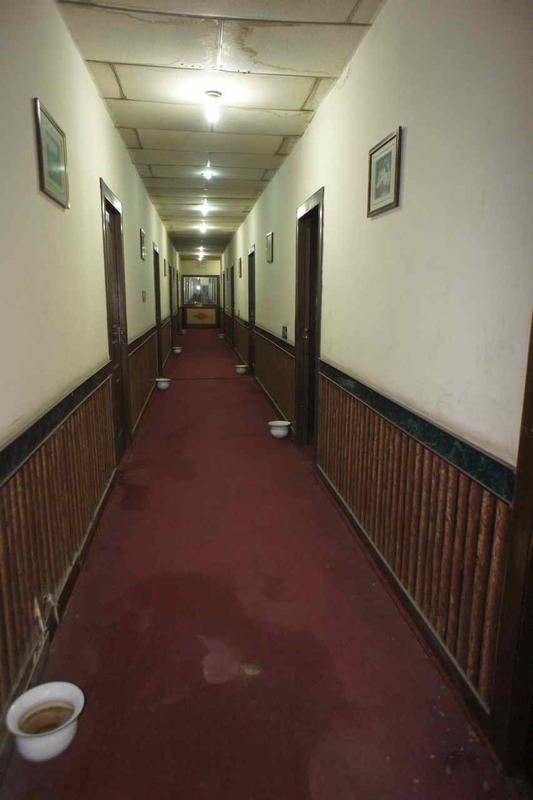 Meanwhile, enjoy these pictures from the very nice hotel we have been staying at. This entry was posted in Posts in English on August 21, 2013 by admin. 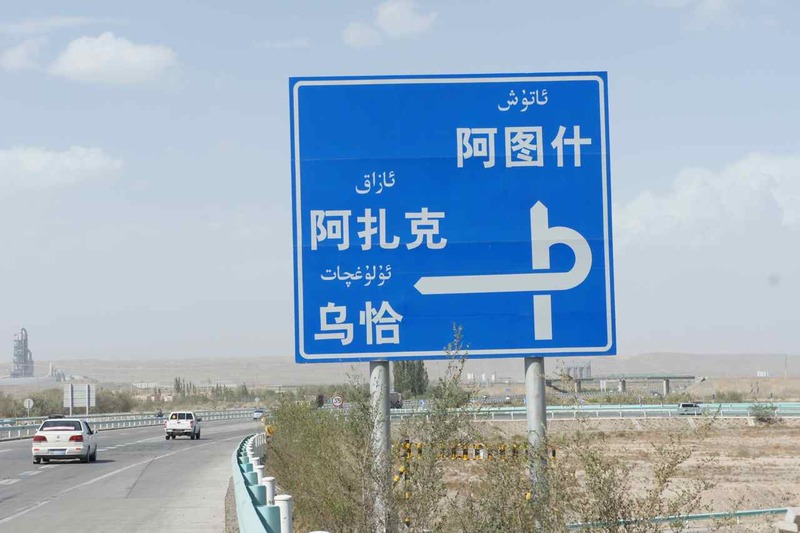 Kashgar is not a big city be Chinese measures, but definately by Swedish. We loved being in a proper city again. It was wonderful to walk on busy pavements, drop into shops and just look at the city life. Our shopping tour got us two out of three things we needed. We take a lot of photos and make many videoclips. The hard drive on our computer is soon full and we needed to do something about that. The solution was to go to a shop and buy a new external hard drive which has now enabled us to make some free space in the computer’s hard drive. The shop in the department store where we bought the new hard drive looked very much like one of those in good old Panthip Plaza in Bangkok. 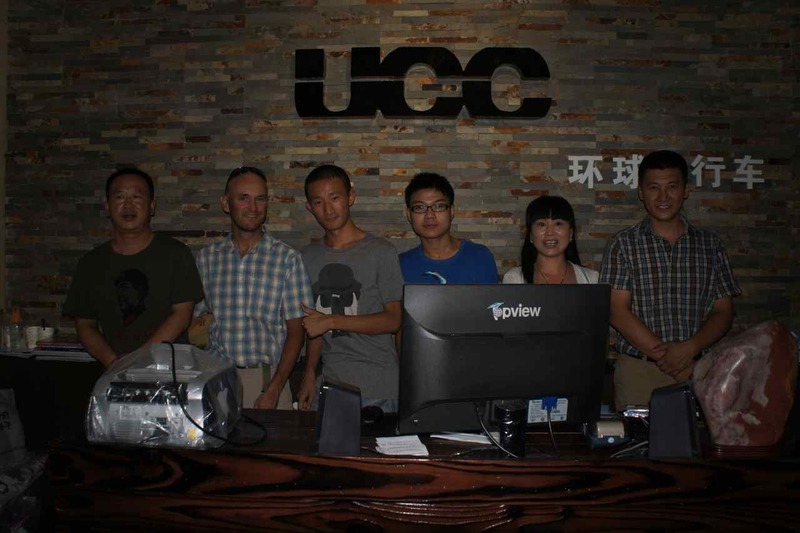 The day before leaving Kashgar we also bought a chinese SIM-card to use in our iphone. It ”only” took two hours to explain what we wanted but still we haven’t got any answer to the very important question of how to re-load it with more money… We hope our new SIM-card will enable us to communicate more frequently with e-mail and blog updates even from our cosy tent. Our pump shows signs of wearing out so I cycled to the only good bike shop in Kashgar only to find that they had no pumps for tubes with car valves… Maybe I should have tried at the local bazar instead – at least the bazar in Osh had the kind of pumps I was looking for. 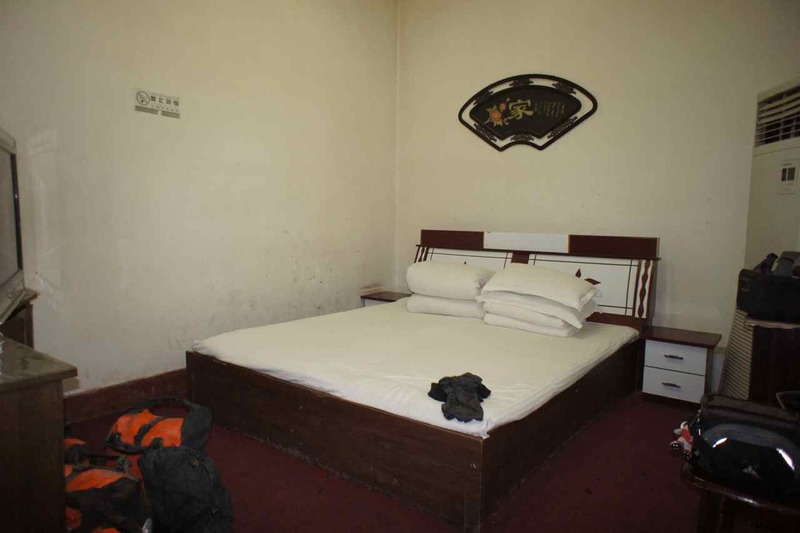 We liked our cosy hotel room in Kashgar and didn’t really want to leave. 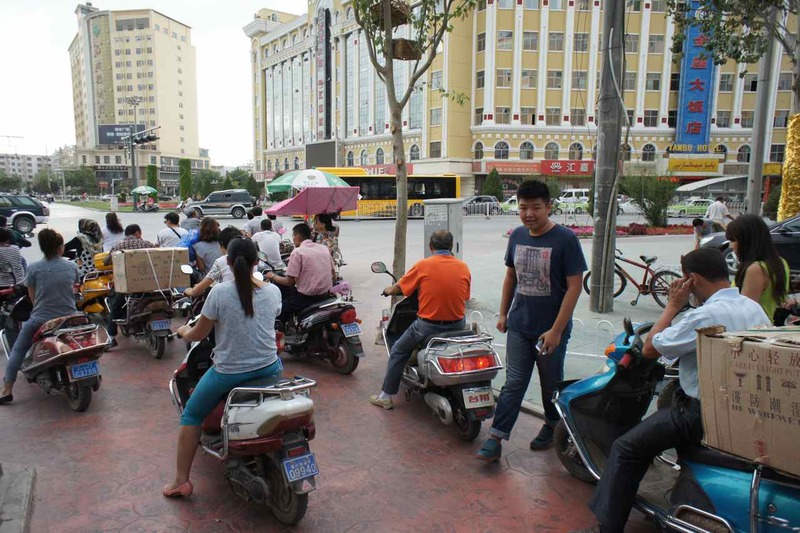 However, the visa clock has started to tick and China is a big country so there was only one thing to do and that was to get up on our bikes and start cycling. Our strategy for China is to push a little bit harder than usual in the beginning in order to crack the backbone of the distance through China within a month. The first part doesn’t have so many sights and we think it is the landscape that is the attraction and this we can enjoy from our saddles. Reading road signs is a major challenge. 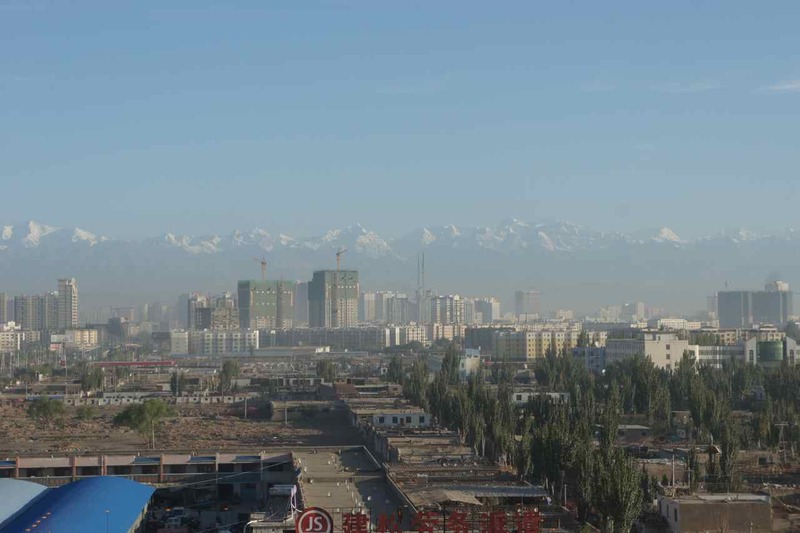 We had spoiled ourselves at the hotel in Kashgar and when we looked out of the window the morning we were leaving we saw a cloudy sky and it looked like it was cold. Once outside it turned out to be not only cool but also windy. 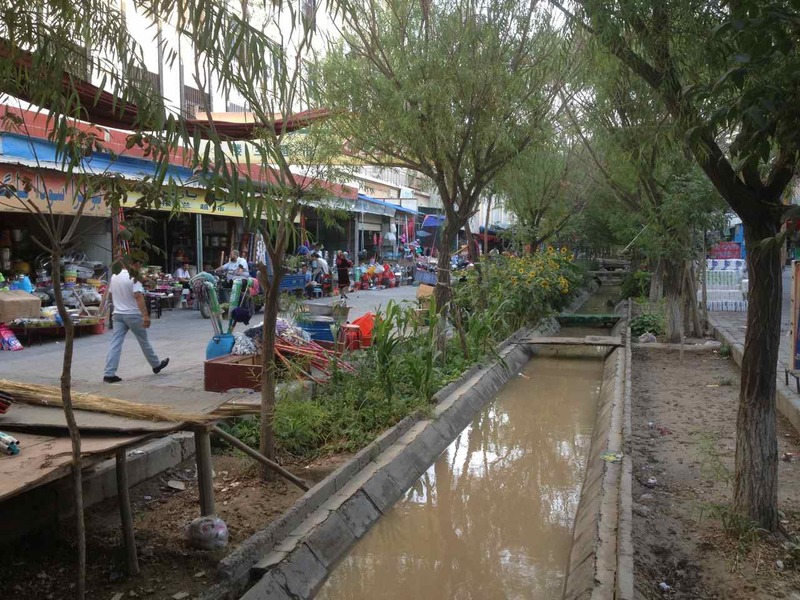 Our last minute shopping adventures resulted in a very late start from Kashgar. 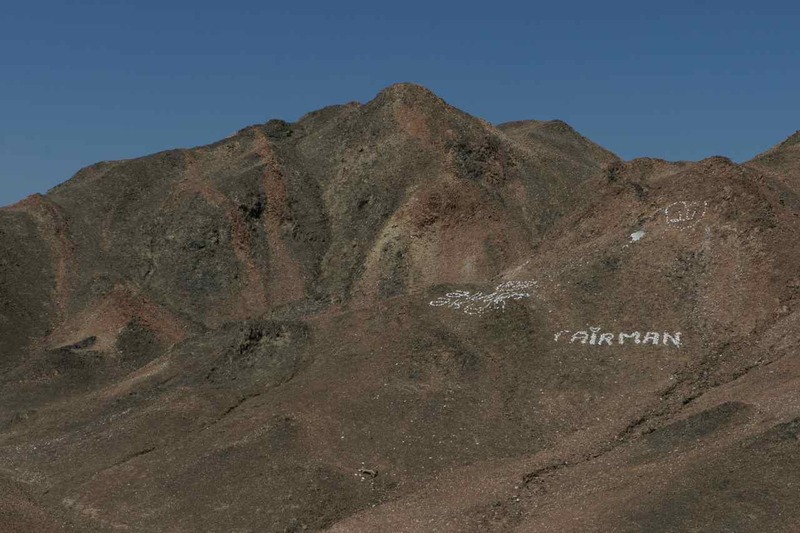 It looked more like a bush landscape and we only managed to get the 45 km to city of Artux. This was another cloudy morning and the temperature was cool (20-24 degrees) and if it hadn’t been for the headwind it would have been a perfect day for cycling. 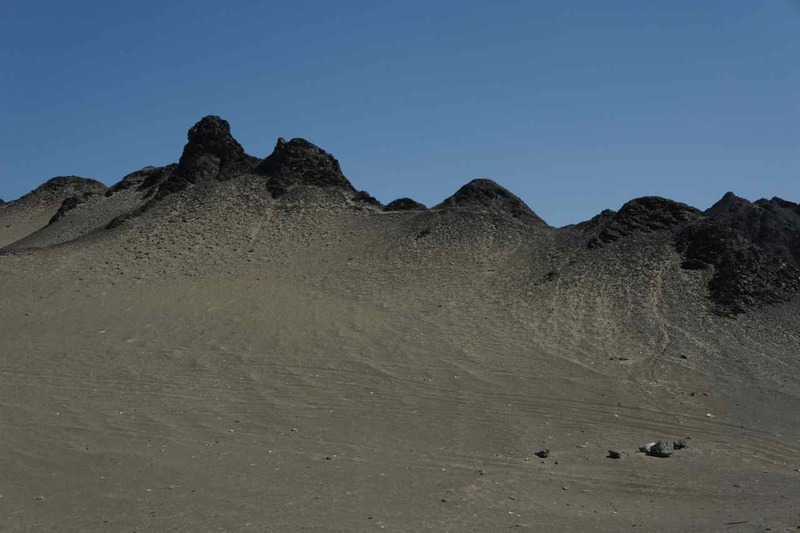 The eastern bound road north of the Taklamakn desert was more boring than we had hoped. 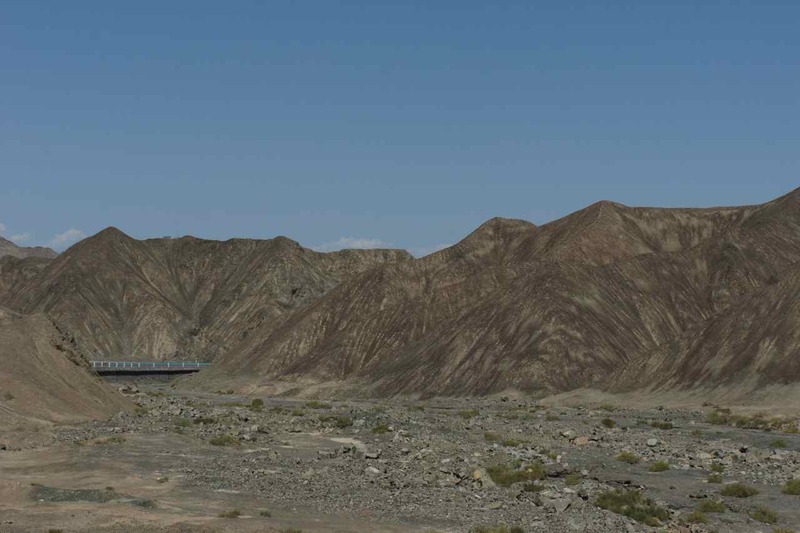 The mountains on our left side was nothing special and on our right side the desert didn’t look like a proper desert. There were also almost no gas stations and restaurants along the way where we could buy supplies or eat. When we finally arrived to a village after about 100 km we stopped to have dinner and buy lots of water before continuing to find a place to pitch our tent, which turned out to be 15 km outside the town. Eventhough the wind got less strong in the late afternoon we wanted to anchor the tent thoroughly. 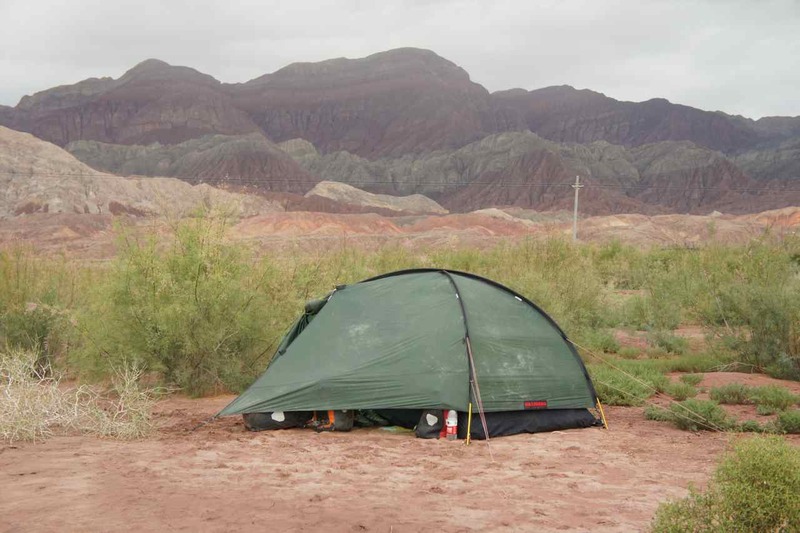 This turned out to be a difficult task since the ground was a loose mix of sand and soil and we had to move the tent a few times to find a spot where the tent pegs would get some grip. 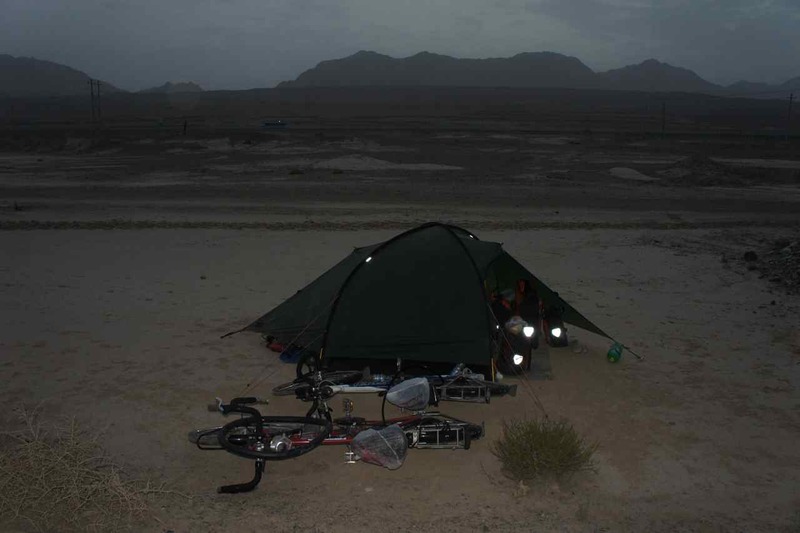 When we went to bed the wind was completely gone – a very ironic situation after having struggled in the headwind and then worked hard to anchor the tent…..
We woke up to the sound of rain and a strong wind on the wrong side of the tent. It wasn’t difficult to decide to stay in the warm sleeping bag for another hour. When we finally crawled out of the tent we discovered it was cold and windy from the wrong direction and still a bit rainy. This kind of weather is completely different from what we had expected. 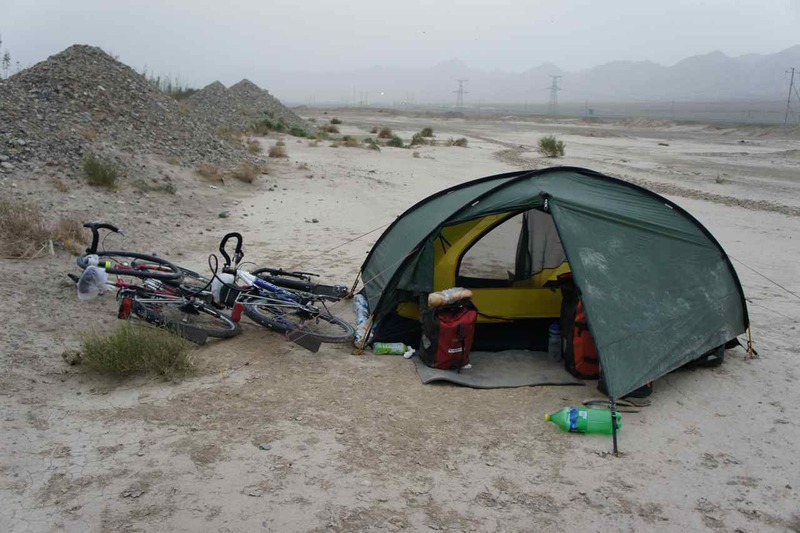 We are riding along the Taklamakan dessert and it is supposed to be hot and dry, not cold and rainy…. 🙁 We do wonder if it is the end of summer that we are experiencing or if it is just temporary bad weather. The road had an intense traffic but it also had a wide shoulder to ride on. 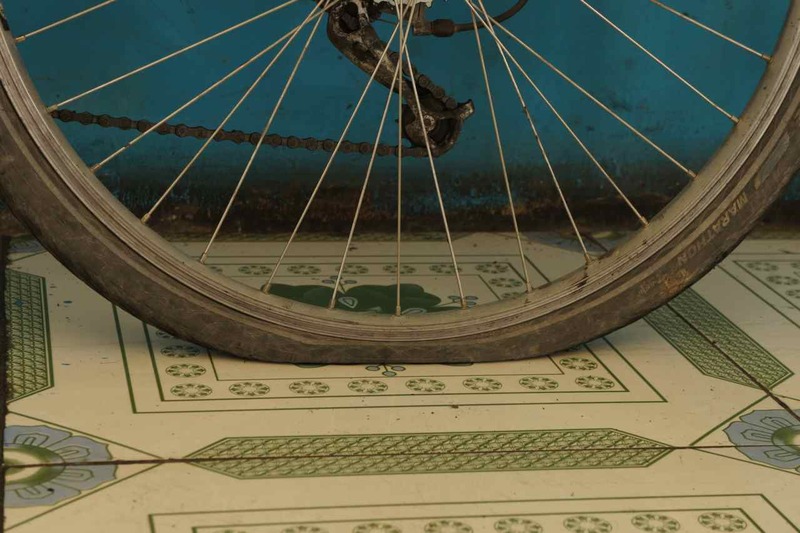 The problem was that there were so many sharp small stones on it and in the late afternoon the inevitable happened – I hit a sharp stone and my front tyre got flat. 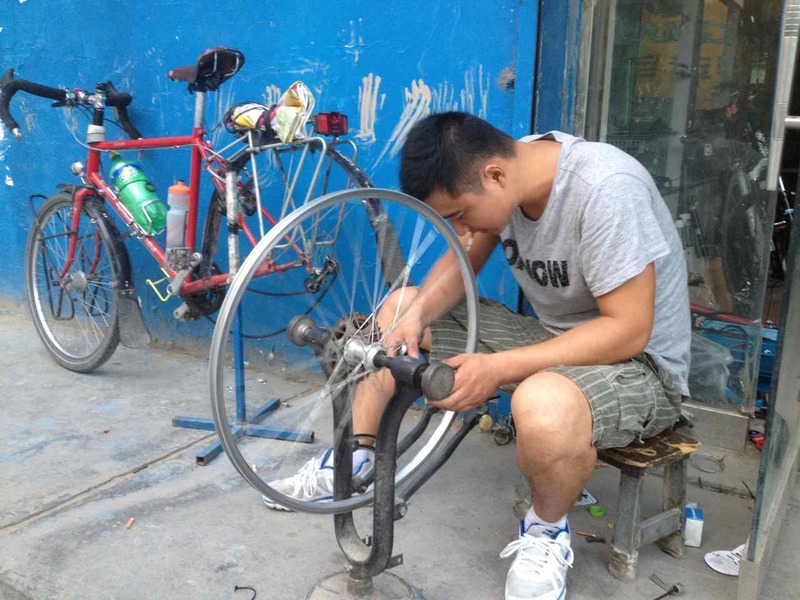 Fixing a flat front tyre. We didn’t see much of the scenery during the day. The cloud base was low and the clouds obscured the mountains. Looking at the mountains is our only form of entertainment and now they were hidden behind the clouds. 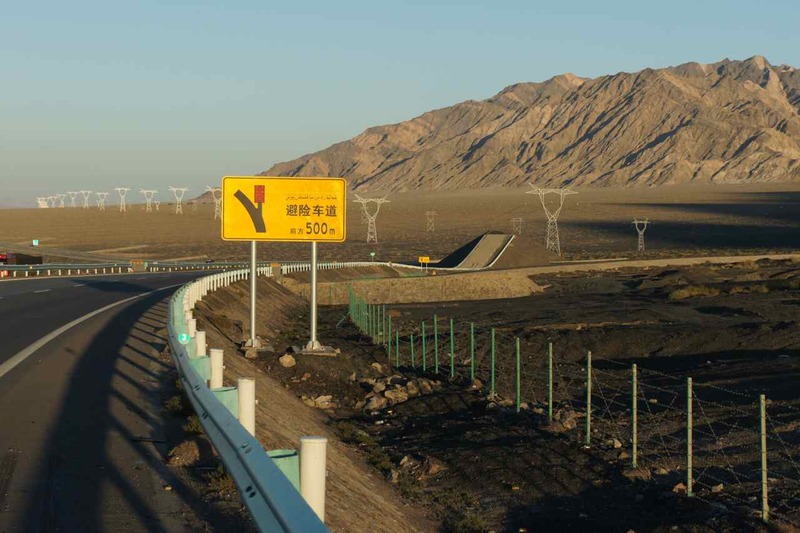 The road leading to Kashgar on the northern side of the Taklamakan dessert is being rebuilt. It is actually more correct to say that they are building a completely new motorway beside the old road. The new motorway is sometimes very close to the old road and sometimes up to a kilometer apart. When we saw a local motorcyclist turning onto that un-finished motorway we decided to follow and found an almost ready motorway that was completely emtpy. Pity that we found out about this road too late in the day. Just like yesterday we didn’t pass any gas stations or villages at all until the end of the day when we arrived to a village which seemed to live on being a food stop for truckers and long haul buses. After having ”lagman” (noodles and meat) for the second day in a row we left the town with our water bottles filled. After having gone through the evening routines the wind ceased. We started to seriously ask ourselves if we should start to ride on the half finished motorway during night time instead. When we sat and had a cup of tea before going to bed the truck traffic increased quickly over just half an hour. There are always a lot of trucks on the road, but now there was an endless caravan. It would be a nightmare to drive a car and try to overtake those trucks. Maybe there is some kind of regulation banning them from using the road during daytime. This morning was very different to the two previous mornings. Sunshine and best of all – no wind. The bad mood and low motivation of yesterday was gone and replaced of enthusiasm and happiness. 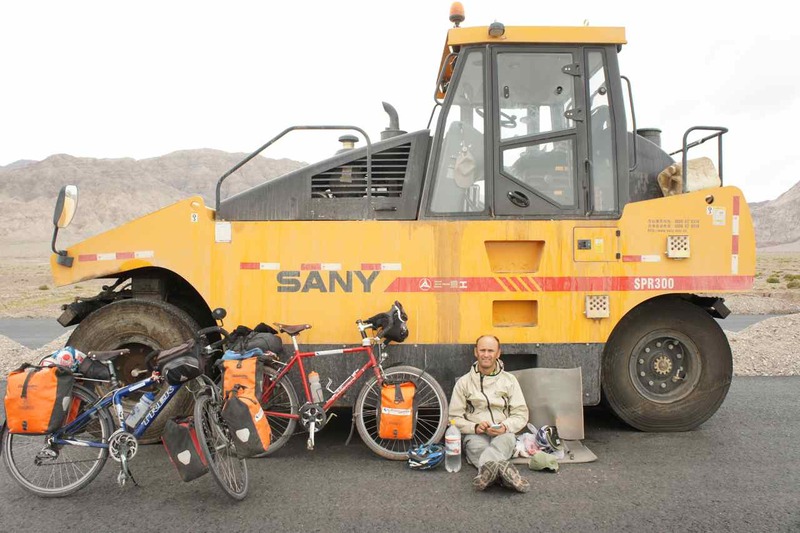 This day we decided to ride on the un-finished motorway from start. There was no traffic apart from some vehicles being used by the road workers so we had to road all to ourselves. 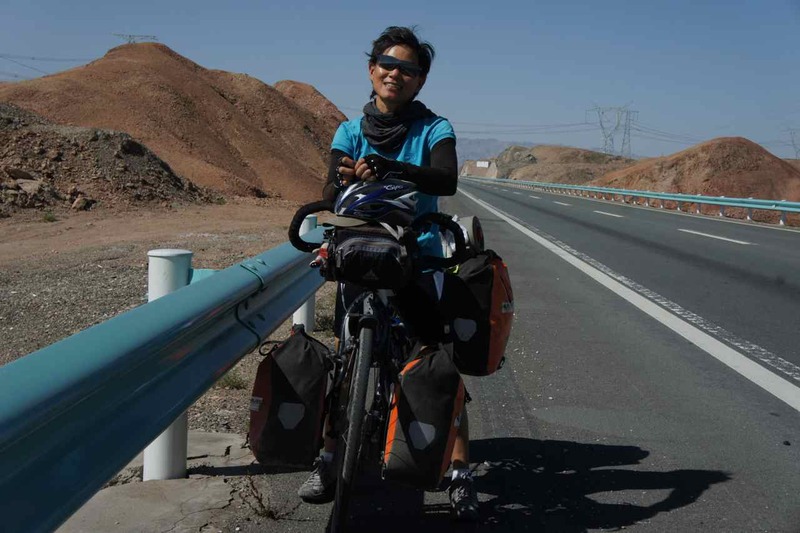 We could ride at high speed (around 27 km/h) and after our lunch break we decided to try to push a little harder in order to reach Aksu which would make a total distance of about 200 km. 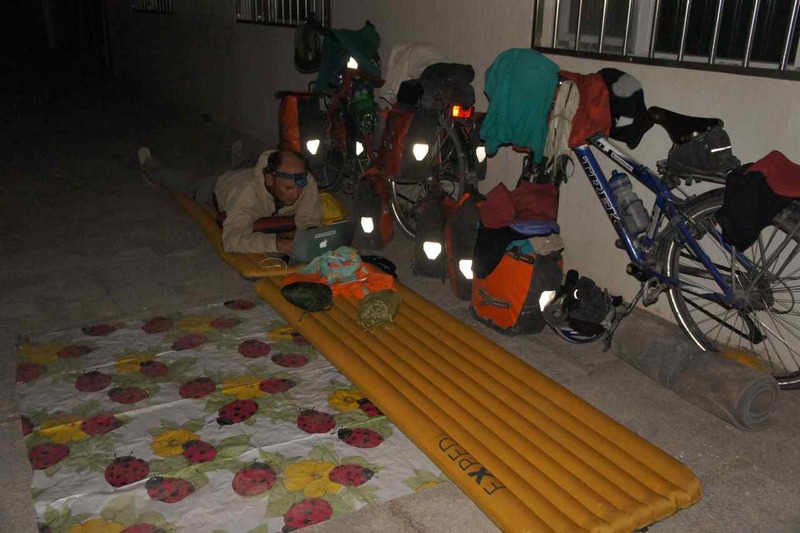 Knowing it is important to eat and rest before getting hungry and exhausted we stopped and had a break every 25-30 km. We still had the motorway to ourselves but late in the afternoon we understood that it would be a race to get to town before sunset and we almost made it. At least we managed to get past the industrial suburbs and into the city center before it got dark. We wanted to stay at a hotel and had made notes of the addresses to a couple of hotels. 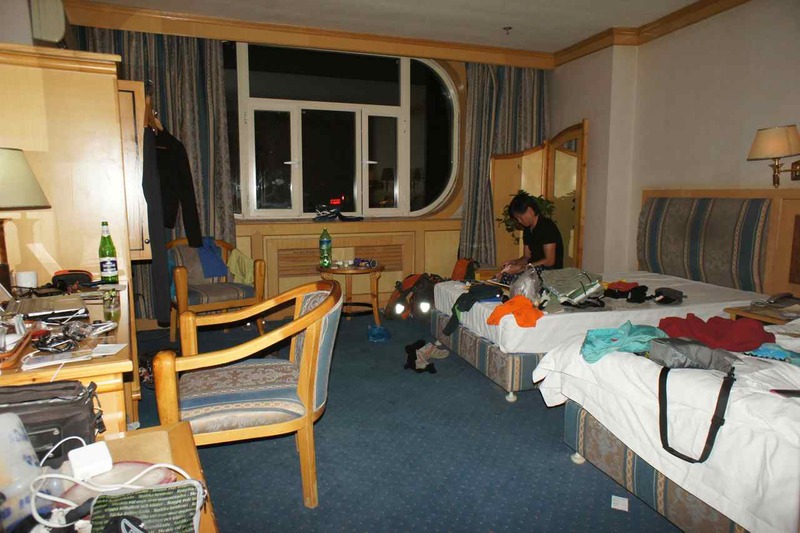 When we checked in at Pudong Holiday Inn, we found the best hotel room so far during the entire trip and the price was only 30 € for both of us including a huge chinese buffet breakfast. 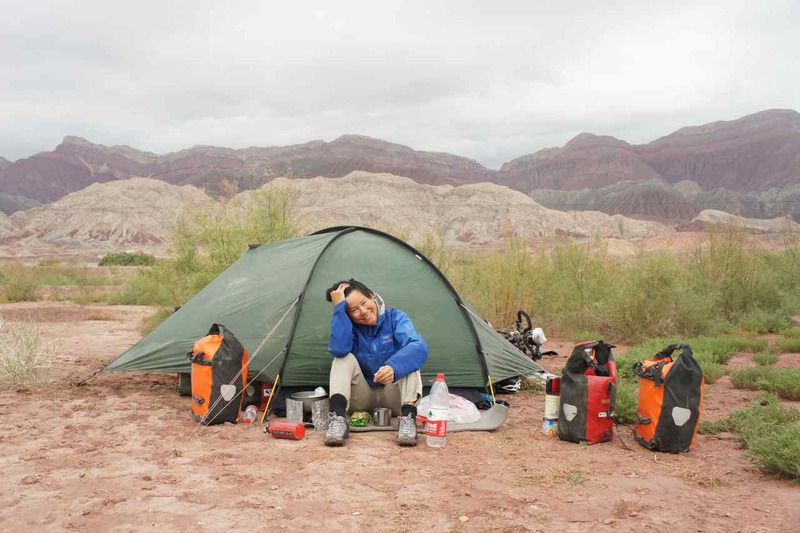 Our plan is to camp 2-4 nights and then stay at a hotel and the hotels we have stayed at in China have been better and better so let’s hope that this trend continues. This entry was posted in Posts in English on August 19, 2013 by admin. This entry was posted in Posts in Thai / โพสต์ภาษาไทย on August 19, 2013 by admin.